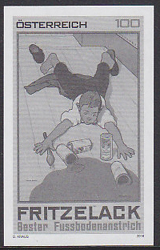 1731 EP AUSTRIA (1918) Suffering people*. 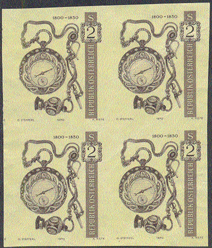 Proof sheet of 6 unissued essays by Hesshaimer, designed to raise money for WWI POWs returning from Siberia. Small (< 1 cm) tear in margin not affecting design. 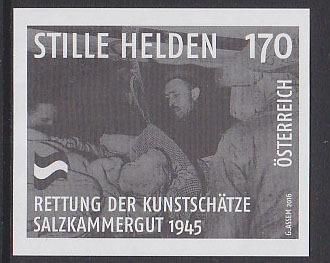 1732 EP AUSTRIA (1918) Suffering people*. Set of 6 unissued essays by Hesshaimer, designed to raise money for WWI POWs returning from Siberia. 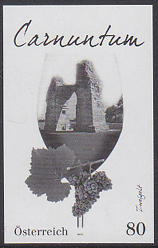 4341 EP AUSTRIA (1947) Roman arch at Carnuntum*. Black proof. Scott No C48, Yvert No PA48. 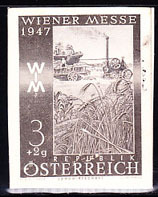 15011 EP AUSTRIA (1947) Wheat harvest. Black proof. Scott No B199, Yvert No 666. Vienna International Sample Fair. 17617 EP AUSTRIA (1947) Textile machinery. Black proof. Scott No B204, Yvert No 671. Vienna International Sample Fair. 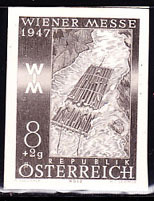 17721 EP AUSTRIA (1947) Log raft. Black proof. Scott No B200, Yvert No 667. Vienna International Sample Fair. 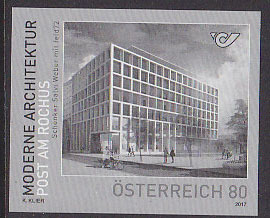 175 EP AUSTRIA (1948) Communal housing project*. Black print. Scott No B230, Yvert No 717. 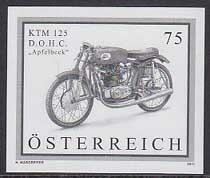 417 EP AUSTRIA (1948) Ges�use Highway*. Black print. Scott No B233, Yvert No 720. 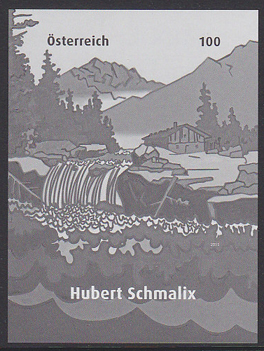 1009 EP AUSTRIA (1948) Vermunt Lake Dam*. Black print. Scott No B226, Yvert No 713. 1276 EP AUSTRIA (1948d) Yellow primrose*. Black print. Scott No B238, Yvert No 725. 1277 EP AUSTRIA (1948e) Pasqueflower*. Black print. Scott No B239, Yvert No 726. 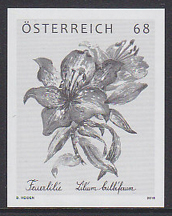 1278 EP AUSTRIA (1948f) Rhododendron*. Black print. Scott No B240, Yvert No 727. 626 EP AUSTRIA (1953) Buzzard*. Black print. Scott No C58, Yvert No PA58. Scott catalog value of regular stamp is $100.00 and of course the black print is much scarcer! 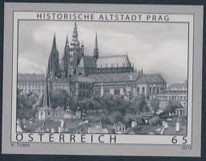 176 EP AUSTRIA (1955) Parliament Building*. Black print. Scott No 599, Yvert No 845. 10th anniversary of Liberation. 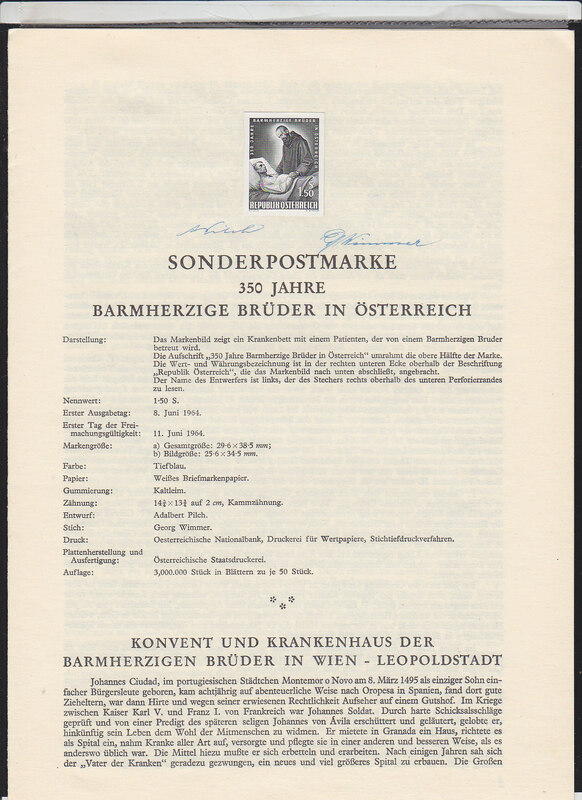 177 EP AUSTRIA (1955) Public housing*. Black print. Scott No 602, Yvert No 848. 10th anniversary of Liberation. 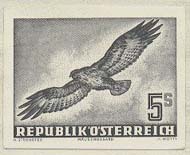 1097 EP AUSTRIA (1955) Austrian Eagle* overprinted "STAATSVERTRAG 1955"*. Black print. Scott No 604, Yvert No 850. State treaty with France, Russia, Britain and US. 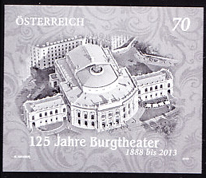 2699 EP AUSTRIA (1955) Vienna Burgtheatr*. Black print. Scott No 606, Yvert No 853. Reopening. 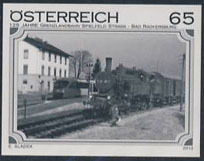 2726 EP AUSTRIA (1955) Western railroad station*. Black print. Scott No 600, Yvert No 846. 10th anniversary of Liberation. 7787 EP AUSTRIA (1955) Mozart*. 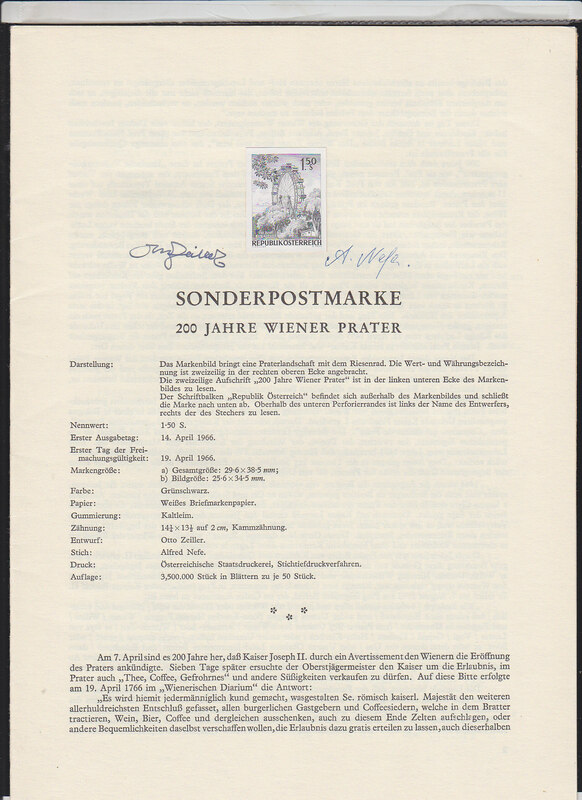 Essay in grey on card stock, signed Wimmer. 16713 EP AUSTRIA (1955) Schubert*. Essay in orange on card stock, signed Wimmer. 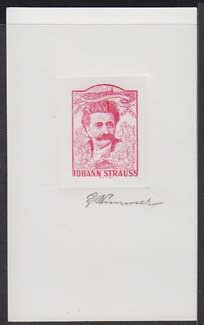 16714 EP AUSTRIA (1955) Strauss*. Essay in red on card stock, signed Wimmer. 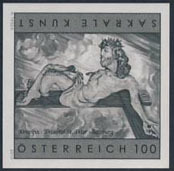 1098 EP AUSTRIA (1960) "EUROPA" atop pillar*. Black print. Scott No 657, Yvert No 922. 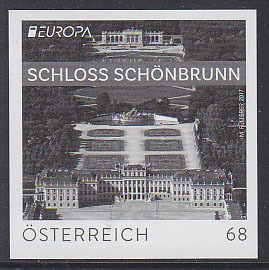 3683 EP AUSTRIA (1962) Esterhazy Palace*. Black proof on thick paper. Scott No 700, Yvert No 959A. 8580 EP AUSTRIA (1962) Electric locomotive*. 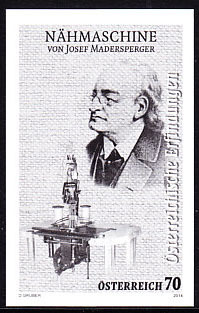 Black proof mounted on booklet in German and signed by the designer and engraver. Scott No 703, Yvert No 964. 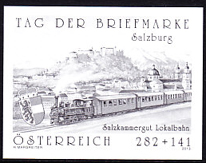 125th anniversary of Austrian railroads. 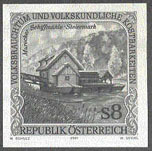 8646 EP AUSTRIA (1962) Austrian forests*. 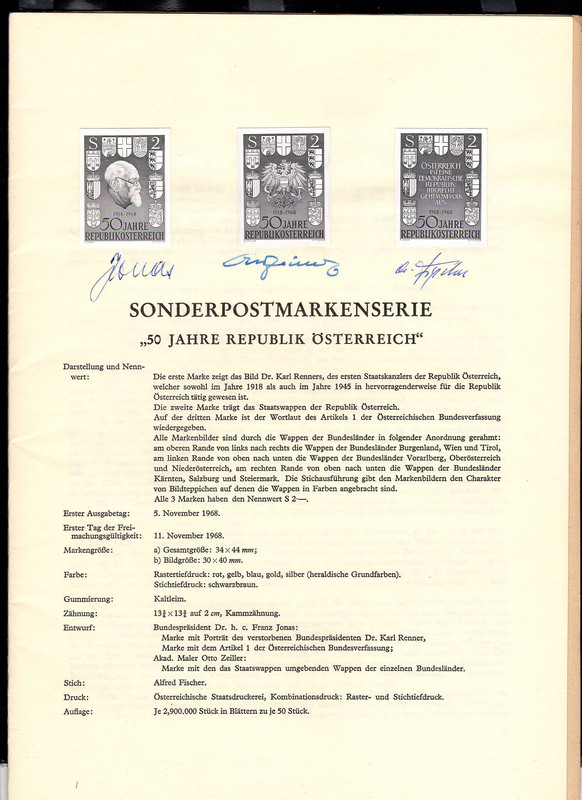 Set of 3 black proofs mounted on booklet in German and signed by the designer and engraver. Scott Nos 685-7, Yvert Nos 961-3. 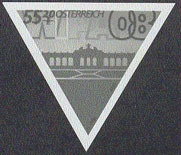 17044 EP AUSTRIA (1962) Scout emblem*. Handshake*. Special black proof. Scott No 684, Yvert No 960. 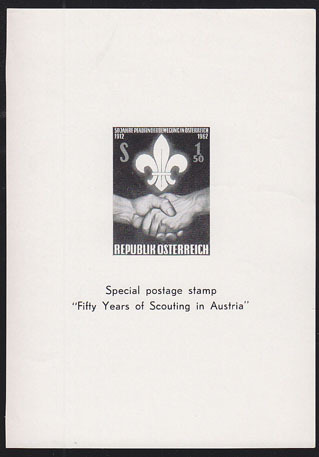 50th anniversary of Austrian Boy Scouts. 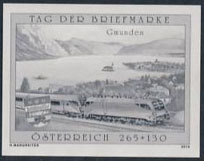 4519 EP AUSTRIA (1963) J.F. Kennedy*. 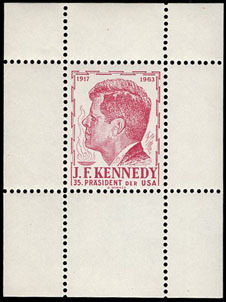 Essay for proposed stamp (never issued) on death of Kennedy, printed on carton. 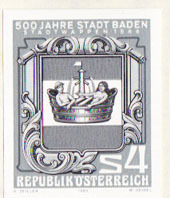 4520 EP AUSTRIA (1963) J.F. Kennedy*. 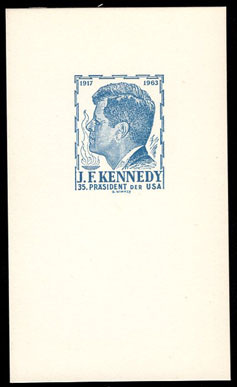 Essay for proposed stamp (never issued) on death of Kennedy, gummed and perforated single. 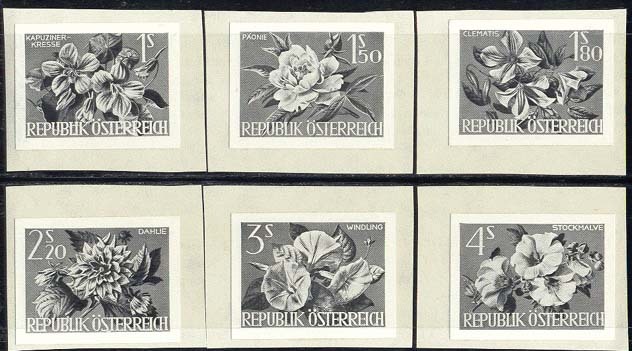 1102 EP AUSTRIA (1964) Stylized flower*. Black print. Scott No 738, Yvert No 1010. 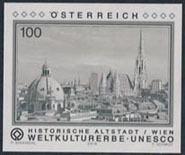 1179 EP AUSTRIA (1964) Scenes of Vienna*. Set of 8 black prints. Scott Nos B306-13, Yvert Nos 1001-8. WIPA Exhibition. 1309 EP AUSTRIA (1964) Flowers*. Set of 6 black prints. Scott Nos 719-24, Yvert Nos 983-8. 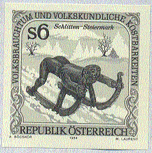 7478 EP AUSTRIA (1964) Laborers*. Black proof mounted on folder in German and signed by the designer and engraver. Scott No 737, Yvert No 1009. Labor Movement Centenary. 8078 EP AUSTRIA (1964) Brother of Mercy*. Patient*. 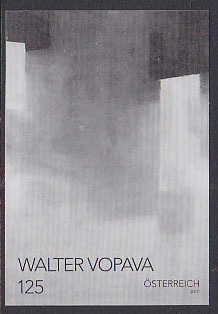 Black proof mounted on booklet in German and signed by the designer and engraver. Scott No 728, Yvert No 992. 350th anniversary of Brothers of Mercy. 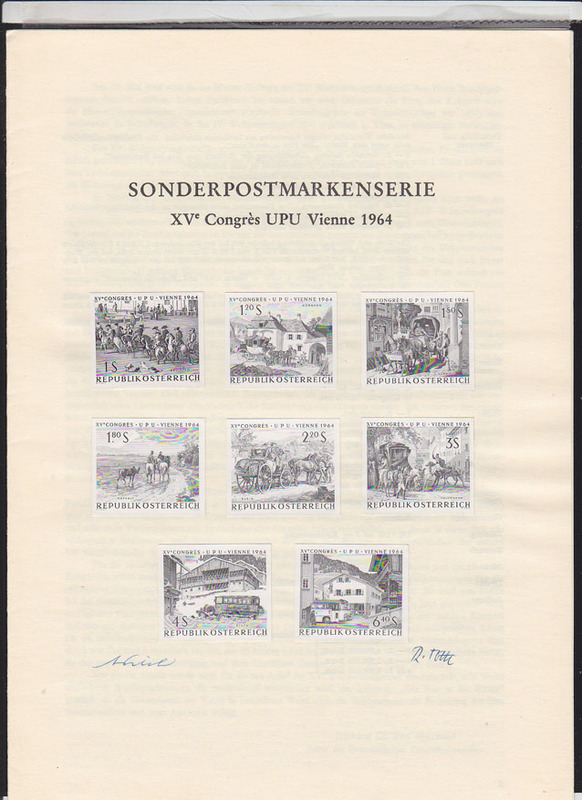 11740 EP AUSTRIA (1964) 15th UPU Congress. Set of 8 black prints mounted on folder in German and signed by the designer and engraver. Scott Nos 729-36, Yvert Nos 993-9. 11741 EP AUSTRIA (1964c) "The Honeymoon Trip", by von Schwind*. Black proof. Scott No 731, Yvert No 995. 15th UPU Congress. 11742 EP AUSTRIA (1964d) "After the Rain", by Raffalt*. Black proof. Scott No 732, Yvert No 996. 15th UPU Congress. 11743 EP AUSTRIA (1964g) "Postal Sleigh in the Mountains", by Gauermann*. Black proof. Scott No 735, Yvert No 999. 15th UPU Congress. 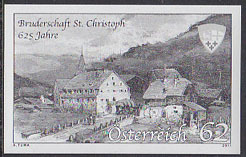 11744 EP AUSTRIA (1964h) "Saalbach Post Office" by Pilch*. Black print. Scott No 736, Yvert No 1000. 15th UPU Congress. 16971 EP AUSTRIA (1964) Brother of Mercy*. Patient*. Black proof. Scott No 728, Yvert No 992. 350th anniversary of Brothers of Mercy. 358 EP AUSTRIA (1965) Various writings and instruments*. Set of 6 black prints. Scott Nos B315-20, Yvert Nos 1020-5. Development of Writing. 6139 EP AUSTRIA (1965) Buildings*. 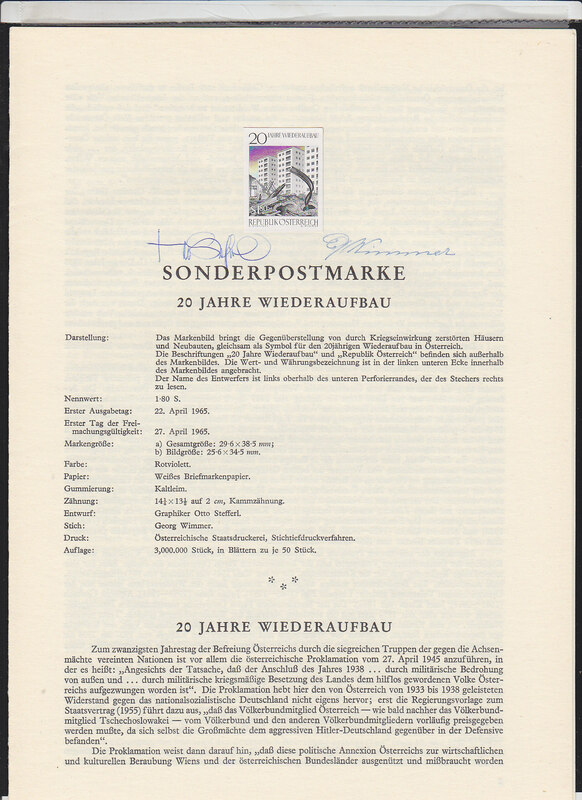 Black proof affixed to folder in German and signed by the designer and engraver. Scott No 742, Yvert No 1015. 20 years of reconstruction. 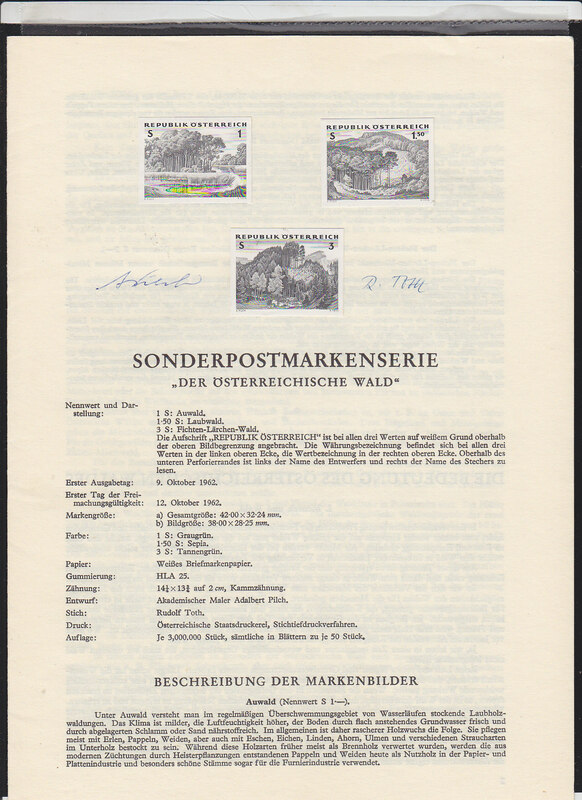 6224 EP AUSTRIA (1965) Ferdinand Waldmuller*. Black proof affixed to folder in German and signed by the designer (and engraver). Scott No 749, Yvert No 1029. Wrote romantic magical comedic plays. 6996 EP AUSTRIA (1965) Eagles with Castle hat*. 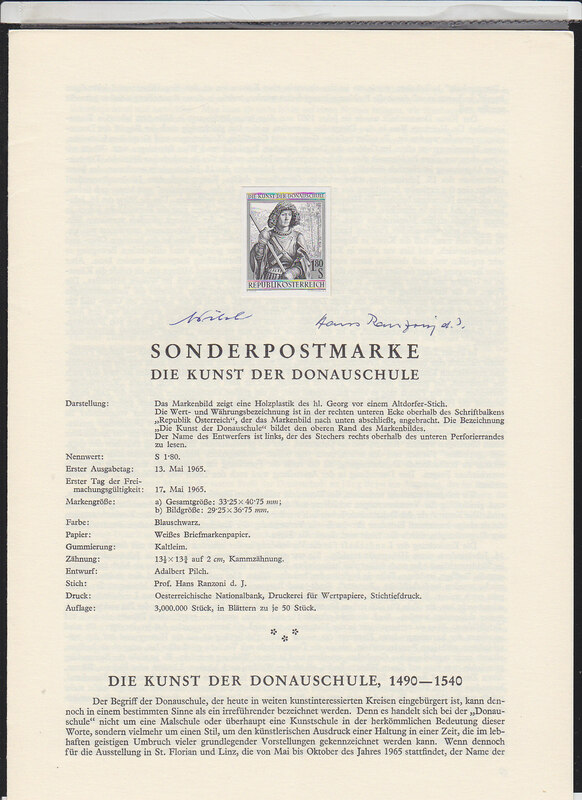 Black proof affixed to folder in German and signed by the designer and engraver. Scott No 753, Yvert No 1031. 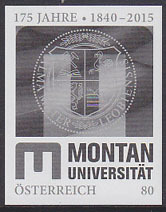 7086 EP AUSTRIA (1965) Seal of University of Vienna*. Black proof affixed to folder in German and signed by the designer and engraver. Scott No 743, Yvert No 1019. 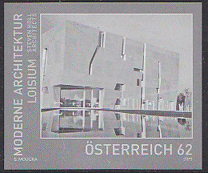 7087 EP AUSTRIA (1965) Vienna Technical School*. 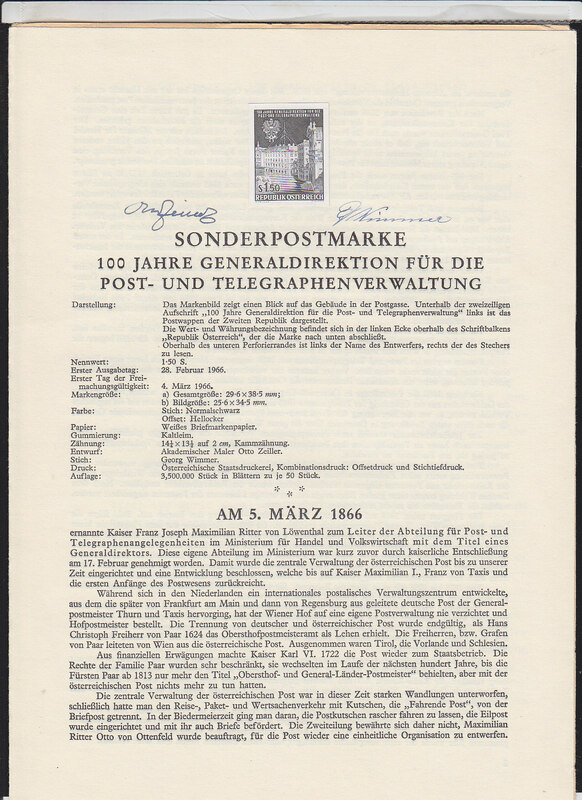 Black proof affixed to folder in German and signed by the designer and engraver. Scott No 755, Yvert No 1033. 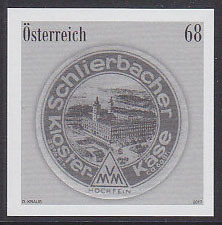 7521 EP AUSTRIA (1965) J.F. Kennedy*. 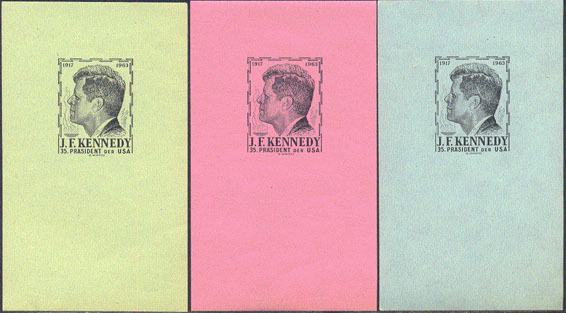 Set of 3 imperforate essays in different colors. 7613 EP AUSTRIA (1965) Semmelweiss*. 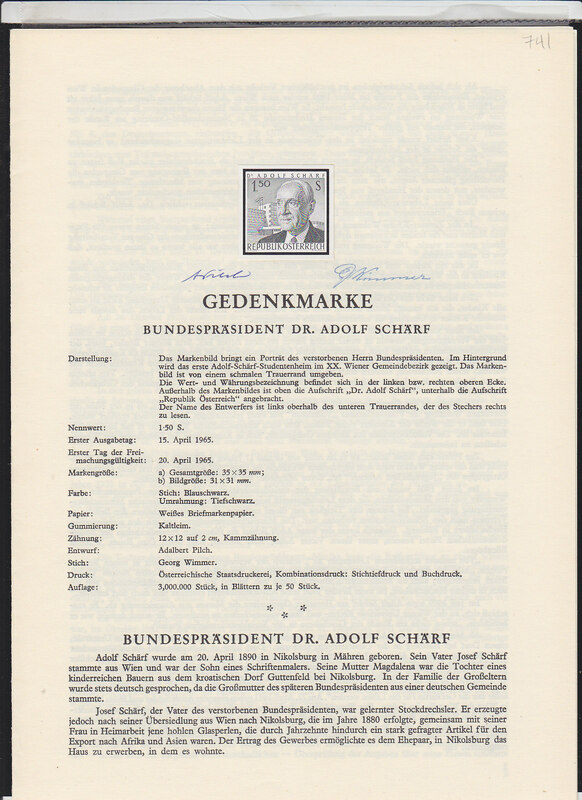 Black proof affixed to folder in German and signed by the designer and engraver. Scott No 746, Yvert No 1028. 8126 EP AUSTRIA (1965) St. George wood sculpture*. 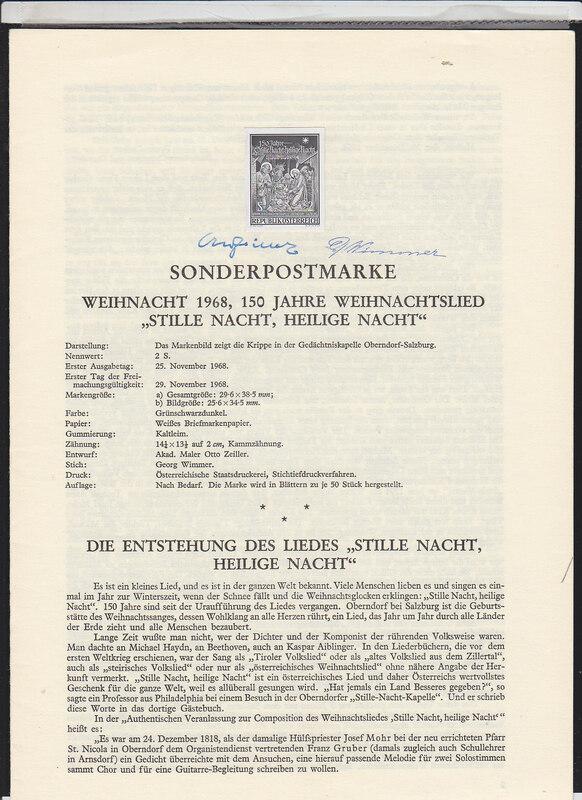 Black proof affixed to folder in German and signed by the designer and engraver. Scott No 744, Yvert No 1016. Danube Art School. 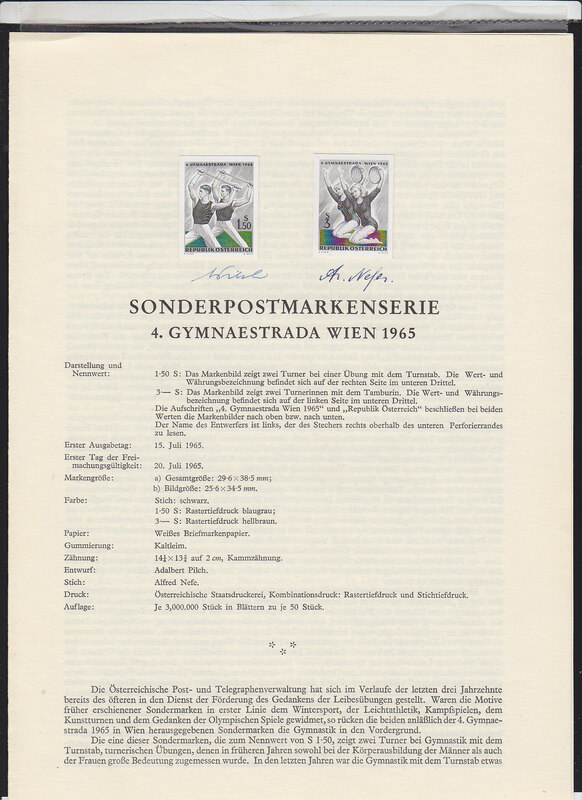 8230 EP AUSTRIA (1965) Gymnastics*. Black proofs affixed to folder in German and signed by the designer (and engraver). Scott Nos 750-1, Yvert Nos 1026-7. 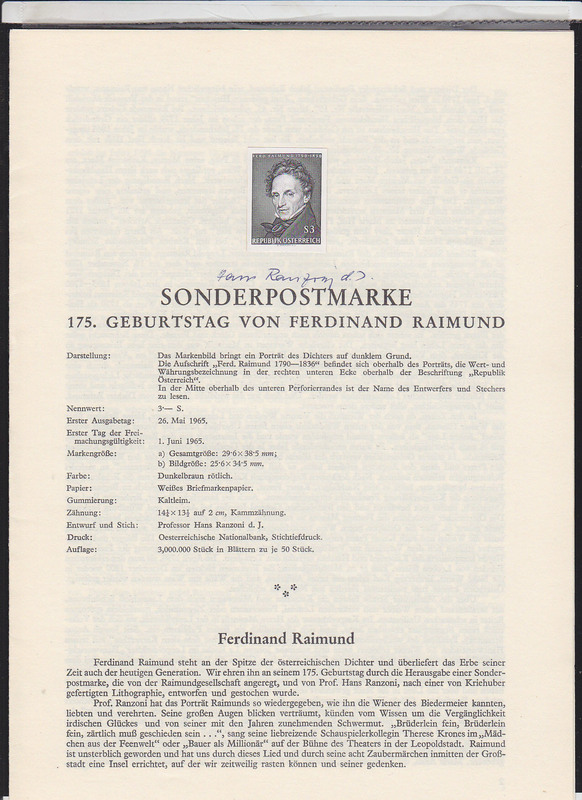 8539 EP AUSTRIA (1965) Ferdinand Raimund*. Black proof affixed to folder in German and signed by the designer (and engraver). Scott No 748, Yvert No 1019. Wrote romantic magical comedic plays. 1602 EP AUSTRIA (1966) Peter Anich*. Black print. Scott No 771, Yvert No 1051. First survey of Tirol. 7200 EP AUSTRIA (1966) Ferris wheel*. 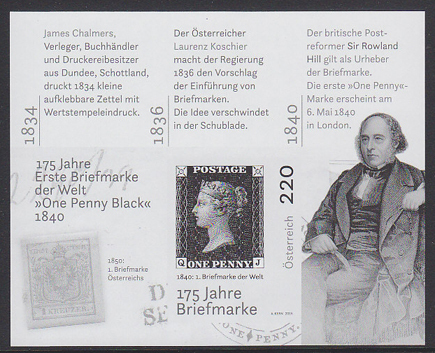 Black proof afixed to booklet in German and English and signed by the designer and engraver. Scott No 759, Yvert No 1039. 200th anniversary Vienna Prater. 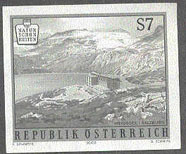 7952 EP AUSTRIA (1966) PTT Centenary. 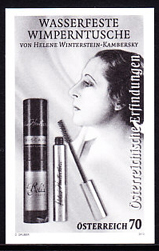 Black proof affixed to booklet in German and English, signed by the designer and engraver. Scott No 757, Yvert No 1038. 15389 EP AUSTRIA (1966) "Livre du Cuer d'Amours Espris" by Duke D'Anjou*. Black proof. Scott No 776, Yvert No 1057. 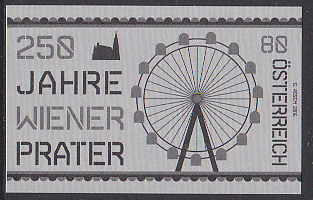 16082 EP AUSTRIA (1966) Ferris wheel*. Black proof. Scott No 759, Yvert No 1039. 200th anniversary Vienna Prater. 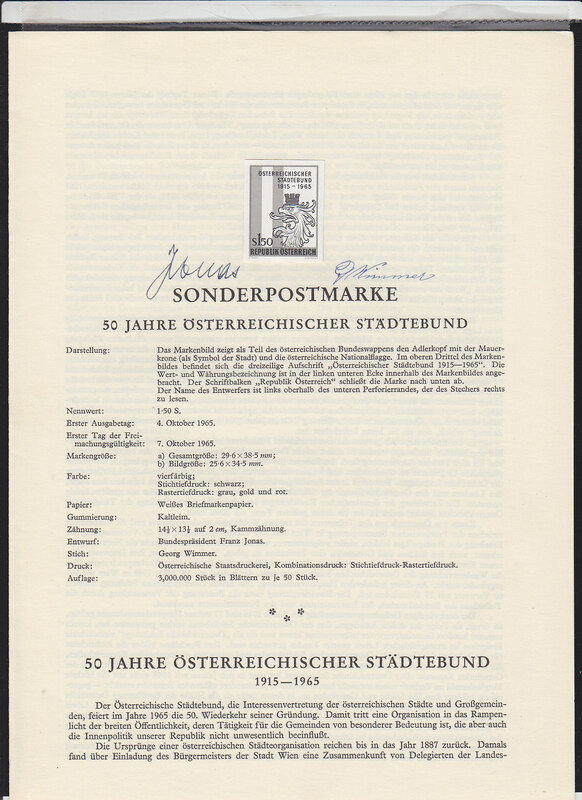 16506 EP AUSTRIA (1966) Map of postal zones. Black proof. Scott No 756, Yvert No 1036. 16507 EP AUSTRIA (1966) Geographica Blavania*. Hercules*. Kronos*. Celestial sphere*. Black proof. Scott No 774, Yvert No 1055. 2219 EP AUSTRIA (1967) Frankfurt Medal*. Black print. Scott No 801, Yvert No 1083. 450th anniversary of the Reformation. 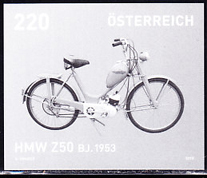 2240 EP AUSTRIA (1967) Vienna*. Black print. Scott No 794, Yvert No 1075. 10th Europa talks "Science & Society in Europe." 2793 EP AUSTRIA (1967) Stone Pines*. Black print. Scott No 802, Yvert No 1084. Centennial of Academic Study of Forestry. 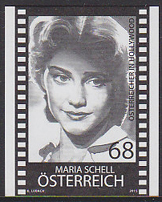 6365 EP AUSTRIA (1967) Madonna*. Black proof mounted on folder in German (with English translation insert) and signed by the designer and engraver. Scott No 791, Yvert No 1072. 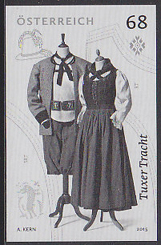 Austrian Gothic. 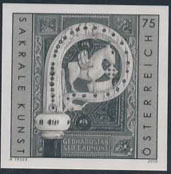 7766 EP AUSTRIA (1967) Cello*. Black print mounted on folder in German and signed by the designer and engraver. Scott No 789, Yvert No 1070. 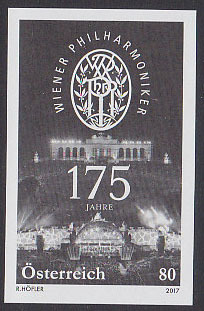 125th anniversary Vienna Philharmonic. 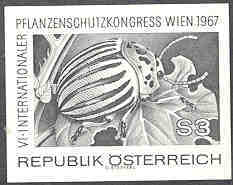 16426 EP AUSTRIA (1967) Potato beetle*. Black proof, 6th International Congress for Plant Protection. Scott No 796, Yvert No 1078. Gorgeous! 16656 EP AUSTRIA (1967) Medieval Gold Cross*. Black print. Scott No 792, Yvert No 1073. Salzburg Treasure Chamber Exhibit. 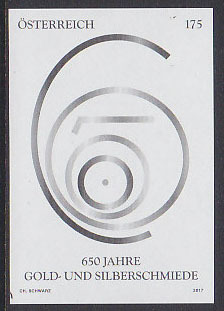 16868 EP AUSTRIA (1967) 16th century playing card*. Black proof. Scott No B323, Yvert No 1089. Stamp Day. 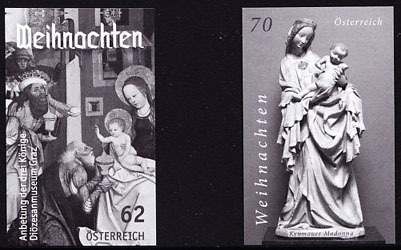 16972 EP AUSTRIA (1967) Gothic Mantle Madonna*. Printer's proof on yellowish paper without gum as printed. Gothic wood carving from Frauenstein. Scott No 791, Yvert No 1072. 1105 EP AUSTRIA (1968) Council of Europe emblem*. Black print. Scott No 838, Yvert No 1122. 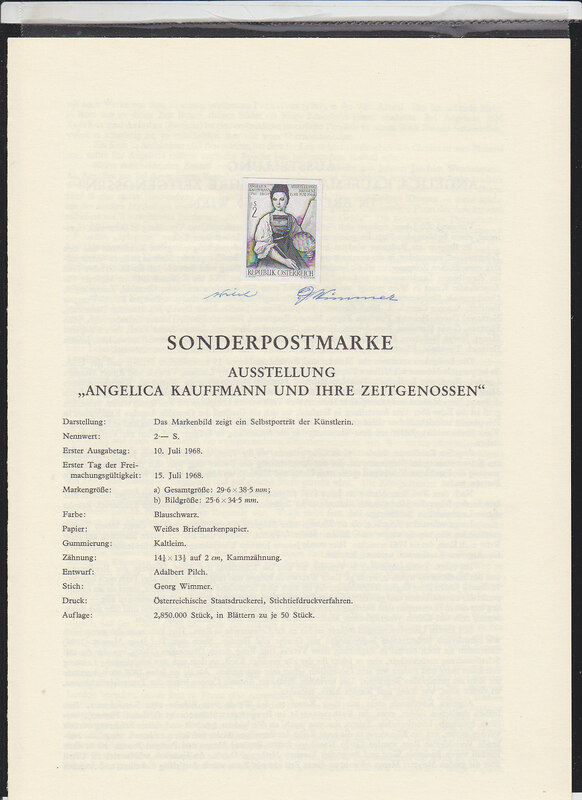 6231 EP AUSTRIA (1968) Angelica Kaufmann*. Black proof mounted on folder and signed by the designer and engraver. Scott No 815, Yvert No 1098. Self portrait. 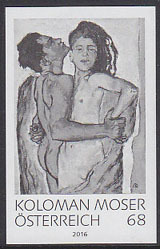 6232 EP AUSTRIA (1968) Koloman Moser*. 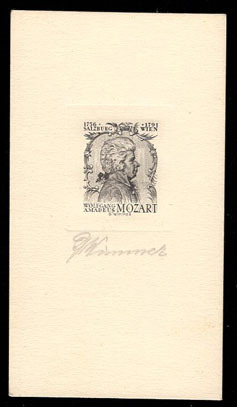 Black proof mounted on booklet in German and signed by the designer and engraver. Scott No 818, Yvert No 1102. 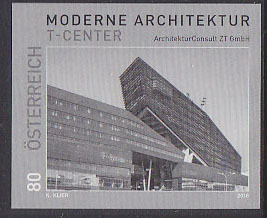 Master of Viennese Modernism. 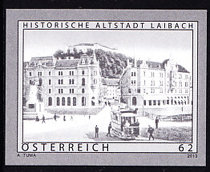 6233 EP AUSTRIA (1968) Baroque frescoes*. 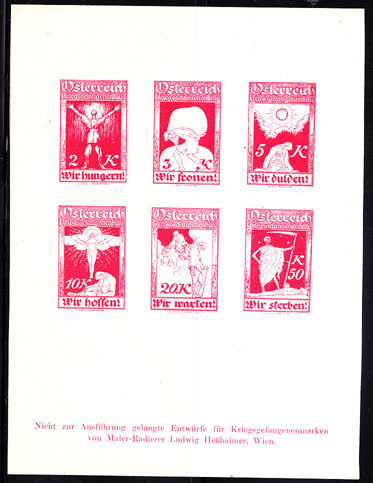 Set of 6 black proofs mounted on illustrated booklet in German (with English translation insert) and signed by the designer and engraver. Scott Nos 824-9, Yvert Nos 1108-13. 6495 EP AUSTRIA (1968) Planes*. Set of 3 black proofs mounted on folder in German and signed by the designer and engraver. Scott Nos C61-3, Yvert Nos PA63-5. 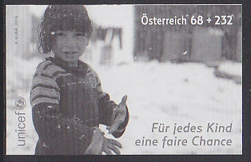 6929 EP AUSTRIA (1968) Creche*. 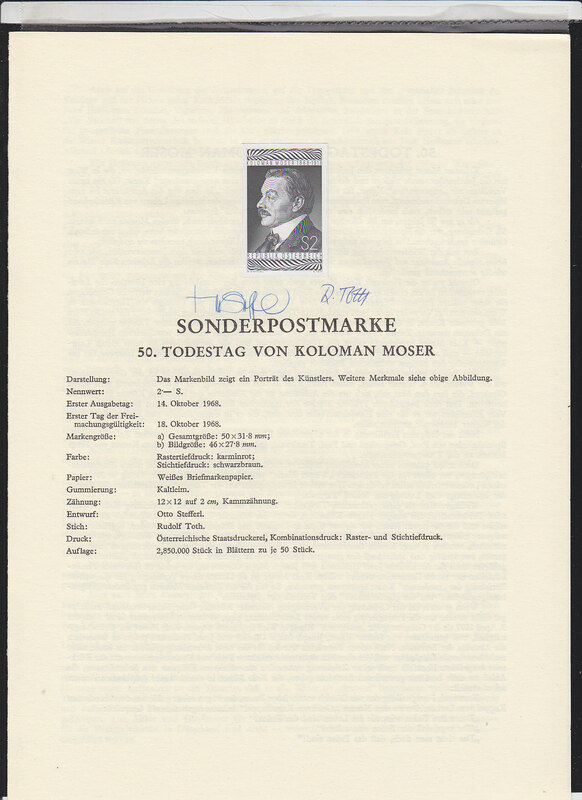 Black proof affixed to booklet in German and signed by the designer and engraver. Scott No 823, Yvert No 1107. 150th anniversary of "Silent Night." 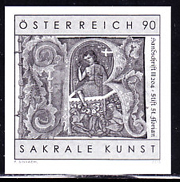 6999 EP AUSTRIA (1968) Renner*. Coats of Arms*. 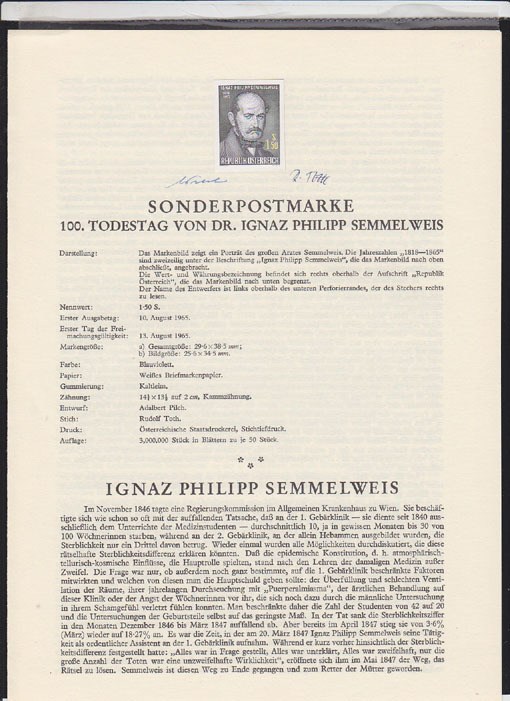 Set of 3 black proofs mounted on booklet in German (with English translation insert) and signed by the designers and engravers. Scott Nos 820-2, Yvert Nos 1103-5. 50th anniversary of the Republic. 7673 EP AUSTRIA (1968) Armor*. 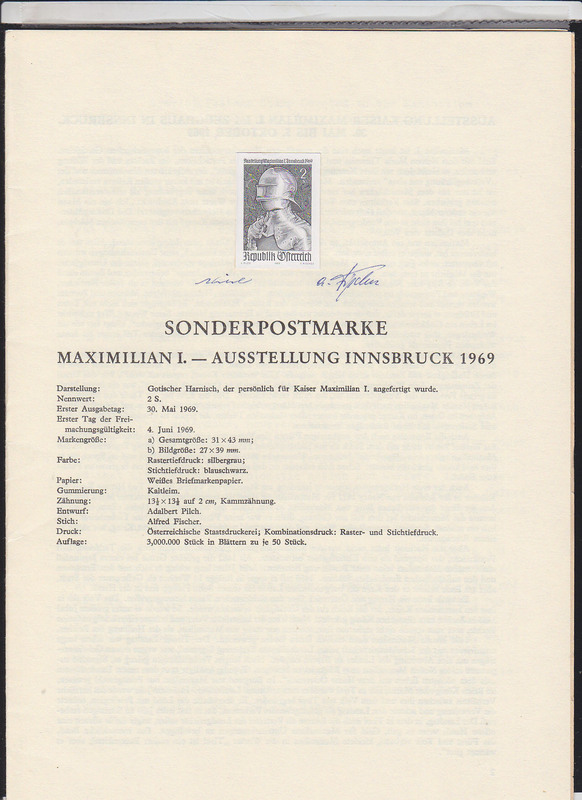 Black print with folder in English and German signed by the designer and engraver. Scott No 841, Yvert No 1132. Gothic armor of Maximilian I. 8526 EP AUSTRIA (1968) Lace veil*. 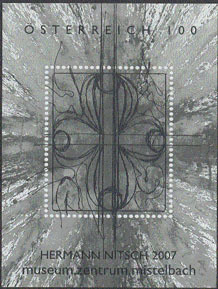 Black proof sffixed to booklet in German and signed by the designer and engraver. Scott No 811, Yvert No 1094. 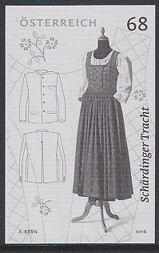 Centennial of Voralberg embroidery industry. 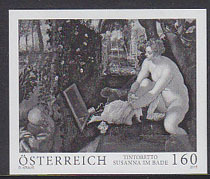 15264 EP AUSTRIA (1968) Baroque frescoes*. Set of 6 black proofs. Scott Nos 824-9, Yvert Nos 1108-13. 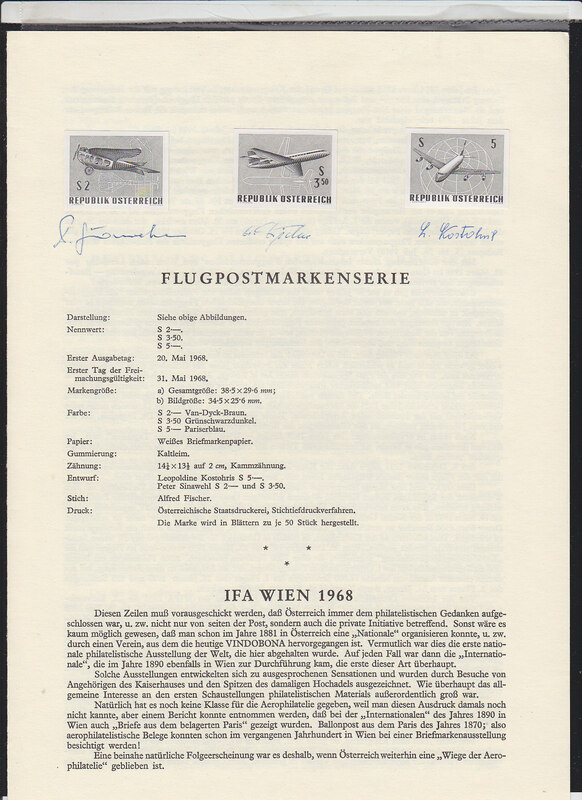 15493 EP AUSTRIA (1968) Planes*. Set of 3 black proofs. Scott Nos C61-3, Yvert Nos PA63-5. 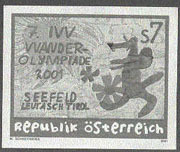 16372 EP AUSTRIA (1968) Horse race. Black proof. Scott No 812, Yvert No 1095. Fredenau centenary. 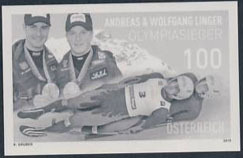 17466 EP AUSTRIA (1968) Innsbruck Stadium*. Black proof. Scott No 807, Yvert No 1090. 17628 EP AUSTRIA (1968) Lace veil*. Black proof. Scott No 811, Yvert No 1094. 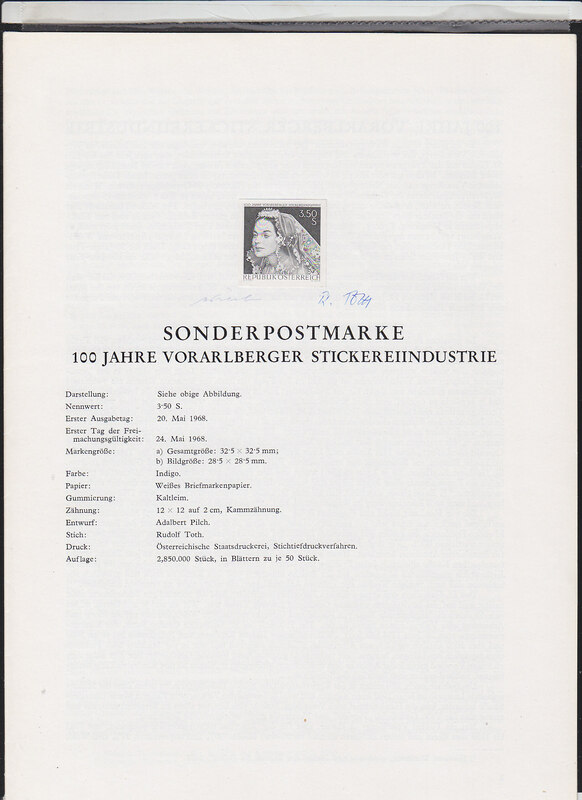 Centennial of Voralberg embroidery industry. 213 EP AUSTRIA (1969a) "The Painter" by Breughel*. Black print. Scott No 849, Yvert No 1144. 214 EP AUSTRIA (1969c) "Self Portrait" by Raphael*. Black print. Scott No 851, Yvert No 1147. 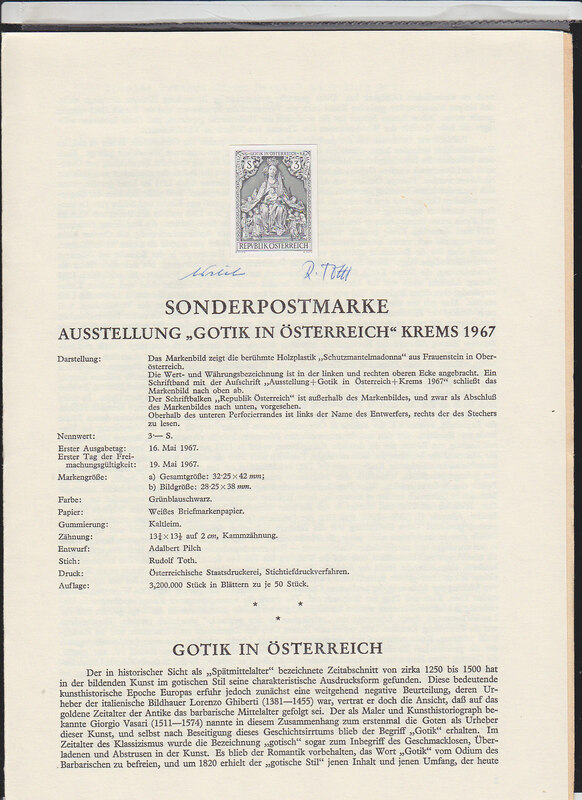 2662 EP AUSTRIA (1969) Posthorn*. Lightning bolt*. Black print. Scott No 855, Yvert No 1138. 50th anniversary PTT. 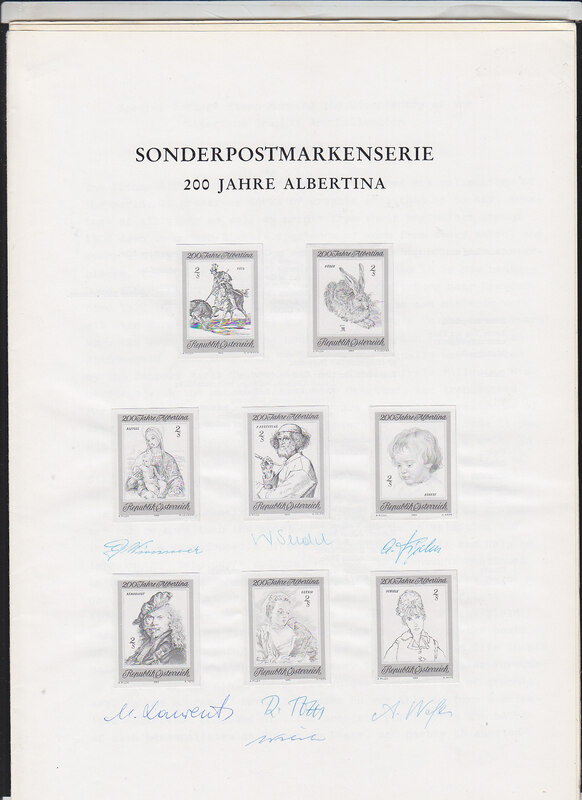 6239 EP AUSTRIA (1969) Etchings in the Albertina*. 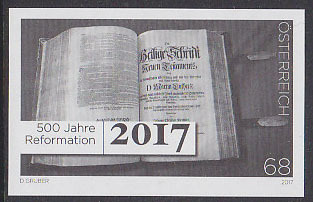 Set of 8 black proofs mounted on illustrated 12-page booklet in German (with English translation insert) and signed by the engravers. Scott Nos 846-53, Yvert Nos 1142-9. 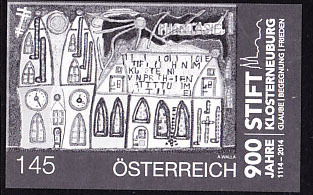 8086 EP AUSTRIA (1969) 500th anniversary of Diocese of Vienna*. 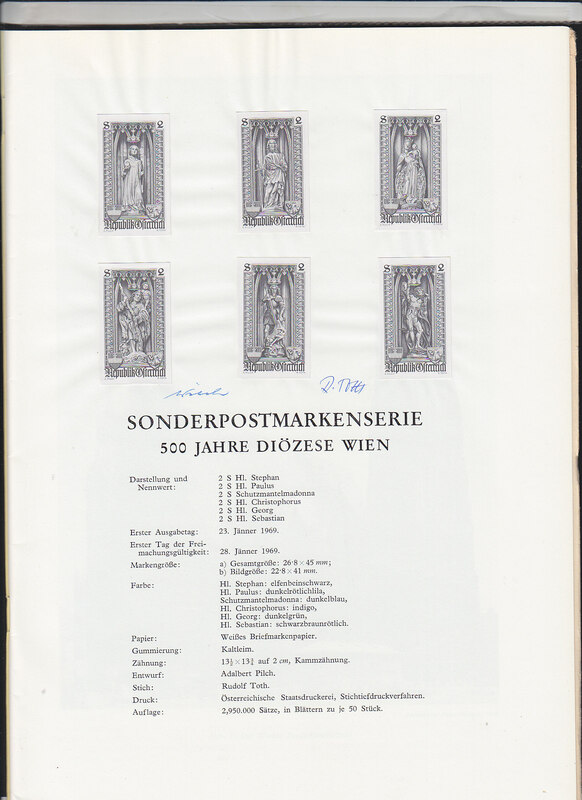 Set of 6 black proofs mounted in 40-page illustrated booklet in German (with English translation insert) and signed by the engravers Scott Nos 830-5, Yvert Nos 1114-9. 16345 EP AUSTRIA (1969) Pallas Athena fountain*. Parliament*. Black proof. Scott No 836, Yvert No 1120. 1181 EP AUSTRIA (1970) Mask*. Building*. Black print. Scott No 878, Yvert No 1163. Salzburg Festival. 1958 EP AUSTRIA (1970) "The Beggar Student" by Millocker*. Black print. Scott No 871, Yvert No 1168. Operettas. 1959 EP AUSTRIA (1970) "The Dream Waltz" by Oscar Strauss*. Black print. Scott No 873, Yvert No 1161. Operettas. 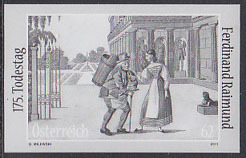 1960 EP AUSTRIA (1970) "The Bird Seller" by Zeller*. Black print. Scott No 874, Yvert No 1168. Operettas. 1961 EP AUSTRIA (1970) "The Bird Seller"*. 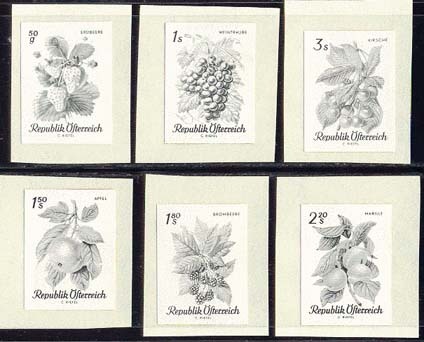 Printer's proof block of 4, imperforate on yellow paper without gum as printed. Opera by Carl Zeller. Scott No 874, Yvert No 1168. 1962 EP AUSTRIA (1970) "Two Hearts in Three Quarter Time" by Stolz*. Black print. Scott No 876, Yvert No 1169. Operettas. 2716 EP AUSTRIA (1970) Pendant watch*. Printer's proof block of 4 on yellowish paper. Without gum as issued. Scott No 868, Yvert No 1174. 2718 EP AUSTRIA (1970b) Lyre clock*. Black print. Scott No 866, Yvert No 1173. Vienna Horological Museum. 2719 EP AUSTRIA (1970c) Pendant clock*. Black print. Scott No 867, Yvert No 1158. 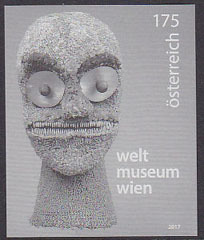 Vienna Horological Museum. 2720 EP AUSTRIA (1970d) Pendant watch*. Black print. Scott No 868, Yvert No 1174. Vienna Horological Museum. 2722 EP AUSTRIA (1970f) French column clock*. Black print. Scott No 870, Yvert No 1175. Vienna Horological Museum. 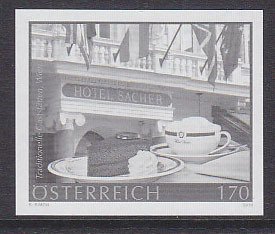 2796 EP AUSTRIA (1970) Josef Schoffel*. Black print. Scott No 858, Yvert No 1150. Saved the Vienna Woods. 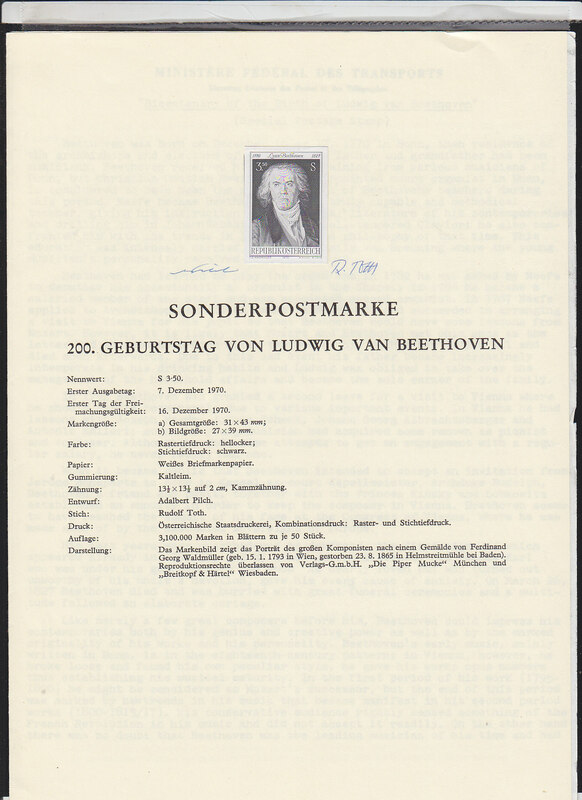 7789 EP AUSTRIA (1970) Beethoven*. Black proof mounted on booklet in German (with English translation insert) and signed by the designer and engraver. Scott No 887, Yvert No 1181. Birth Bicentennial. 10842 EP AUSTRIA (1970) "Two Hearts in Three-Quarter Time"*. Printer's proof on yellow paper without gum as printed, with marginal numbers. Opera by Robert Stoltz. Scott No 876, Yvert No 1169. 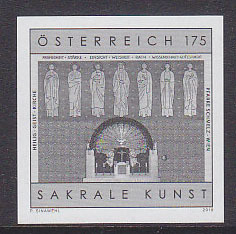 16746 EP AUSTRIA (1970) Organ pipes*. Black proof. Vienna Music Academy. Scott No 864, Yvert No 1156. 16771 EP AUSTRIA (1970) "Der Fledermaus" by Strauss*. Black print. Scott No 872, Yvert No 1167. Operettas. 16772 EP AUSTRIA (1970) "The Merry Widow" by Lehar*. Black print. Scott No 875, Yvert No 1162. Operettas. 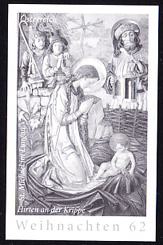 123 EP AUSTRIA (1971) Ivory statue of Josef I*. Black print. Scott No 891, Yvert No 1185. Sculpture by Stenle, 1693. 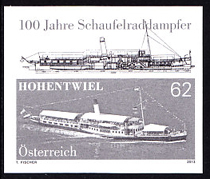 1556 EP AUSTRIA (1971) Florentine vessel*. Black print. Scott No 890, Yvert No 1184. Made of prase (chalcedony) gold and precious stones. 15472 EP AUSTRIA (1971) Child*. Auto headlights*. Black print. Scott No 889, Yvert No 1183. "Watch out for Children. 16653 EP AUSTRIA (1971) Salt cellar by Cellini*. Black proof. Scott No 892, Yvert No 1186. 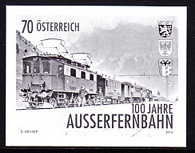 17670 EP AUSTRIA (1971) High speed train*. Black proof. Scott No 911, Yvert No 1205. Intercity rapid trains service - Semmering. 1084 EP AUSTRIA (1972) Power stations & lines*. Set of 3 black prints. Scott Nos 923-5, Yvert Nos 1218-20. 25 years of Power Industry. 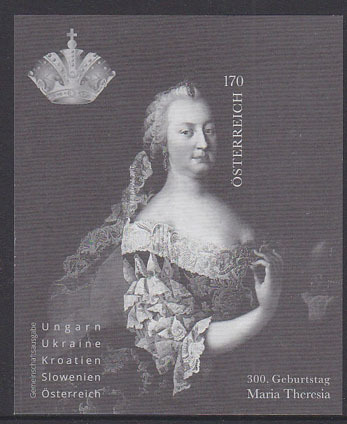 1716 EP AUSTRIA (1972) Otto Loewi*. Black print. Scott No 942, Yvert No 1243. Won Nobel Prize for study of chemical transmission of nerve impulses. 2590 EP AUSTRIA (1972a) Racing sleigh*. Black print. Scott No 934, Yvert No 1236. 2591 EP AUSTRIA (1972b) Coronation Landau*. Black print. Scott No 935, Yvert No 1237. 2592 EP AUSTRIA (1972c) Imperial Stagecoach*. Black print. Scott No 936, Yvert No 1238. 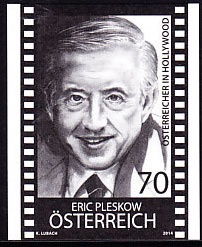 2672 EP AUSTRIA (1972) Telephone*. Map of Austria with phone lines*. Black print. Scott No 937, Yvert No 1235. Automation of Austrian telephone system. 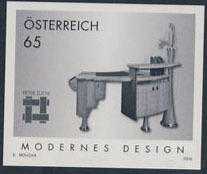 2877 EP AUSTRIA (1972) Fountains*. Set of 3 black prints. Scott Nos 916-8, Yvert Nos 1211-3. 16849 EP AUSTRIA (1972) Pears*. Black print. Scott No 928, Yvert No 1223. World Conference of small-plot gardeners. 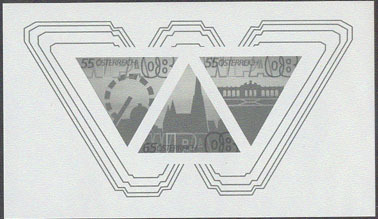 104 EP AUSTRIA (1973) Arms of Vienna Tanners*. Black print. Scott No 951, Yvert No 1251. 13th Congress of International Union of Leather Chemists Societies. 834 EP AUSTRIA (1973) Fritz Pregl*. Black print. Scott No 978, Yvert No 1265. Won Nobel Prize for improving known methods. 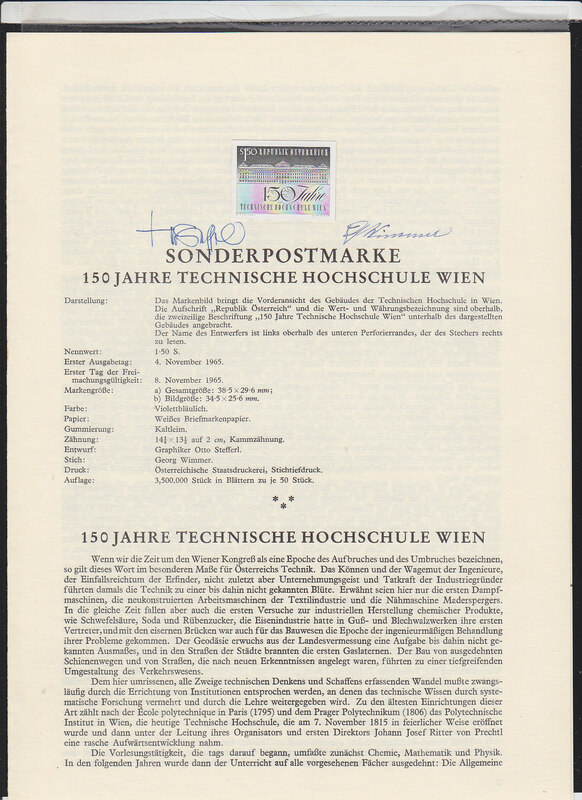 1109 EP AUSTRIA (1973) Posthorn*. Black print. Scott No 944, Yvert No 1244. 1172 EP AUSTRIA (1973) Ship "Tegetthoff"*. Black print. Scott No 949, Yvert No 1250. Discovery of Franz Josef Land centennial. 1456 EP AUSTRIA (1973) Trotter*. Black print. Scott No 953, Yvert No 1255. 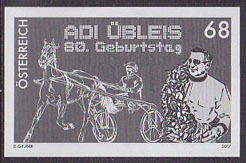 Centennial of Viennese Trotting Association. 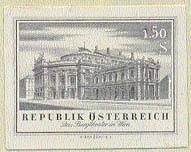 1659 EP AUSTRIA (1973) Vienna Hofburg Gate*. ISI Emblem*. Black print. Scott No 948, Yvert No 1249. 39th Congress International Statistical Institute. 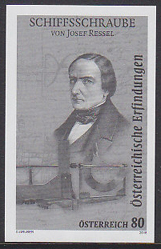 1726 EP AUSTRIA (1973) Academy of Sciences*. Black print. Scott No 950, Yvert No 1252. Centennial of Meteorology Cooperation. 1963 EP AUSTRIA (1973) Leo Slezak*. Black print. Scott No 947, Yvert No 1248. Well known tenor. 2004 EP AUSTRIA (1973) Petzval Lens*. Black print. Scott No 956, Yvert No 1257. EUROPHOT Photographic Congress. 2086 EP AUSTRIA (1973) Police Radio Dispatcher*. Black print. Scott No 955, Yvert No 1256. INTERPOL 50th anniversary. 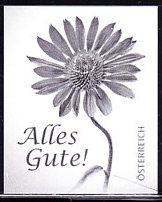 1091 EP AUSTRIA (1974) Mailed hand* holding rose*. Black print. Scott No 1006, Yvert No 1297. Environmental protection. 1111 EP AUSTRIA (1974) King Arthur in armor*. Black print. Scott No 988, Yvert No 1279. From tomb of Maximilian I. 1911 EP AUSTRIA (1974a) Anton Bruckner*. Black print. Scott No 981, Yvert No 1268. 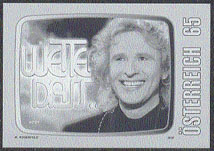 2557 EP AUSTRIA (1974) Diver*. Black print. Scott No 999, Yvert No 1290. 13th European Swimming, Diving, Water Polo Championships. 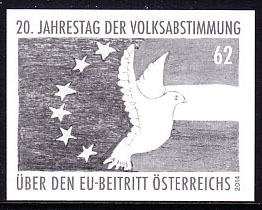 2817 EP AUSTRIA (1974) UPU emblem*. Set of 2 black prints. Scott Nos 1004-5, Yvert Nos 1295-6. UPU Centenary. 9639 EP AUSTRIA (1974) De-Dion-Bouton Motor Trike*. Black proof. Scott No 989, Yvert No 1280. 75th anniversary of Austrian AA. 9761 EP AUSTRIA (1974) Inn Bridge, Alt Finstermunz*. Black proof. Scott No 961, Yvert No 1270. 1116 EP AUSTRIA (1975) "High Priest" by Pacher*. Black print. Scott No 1016, Yvert No 1316. 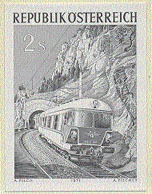 1821 EP AUSTRIA (1975) Gosaukamm funicular*. Black print. Scott No 1017, Yvert No 1317. 1121 EP AUSTRIA (1976) Tassilo Cup*. Black print. Scott No 1038, Yvert No 1345. 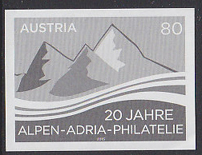 2138 EP AUSTRIA (1976) APA emblem*. Punched tape*. Map of Europe*. Black print. Scott No 1045, Yvert No 1361. 30th anniversary Austrian Press Agency. 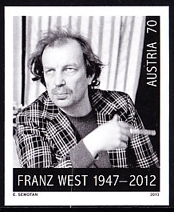 2706 EP AUSTRIA (1976) Pan*. 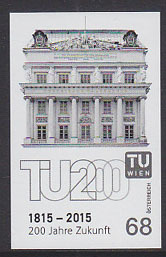 Vienna Burgtheatre*. Black print. Scott No 1030, Yvert No BF8. 200th anniversary. 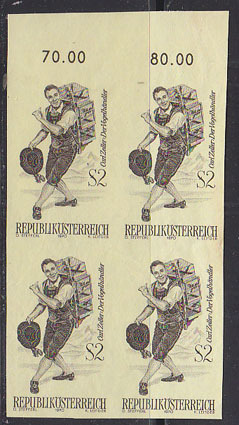 9290 EP AUSTRIA (1976) Augustin the Piper*. Black proof, Brauer painting. Scott No 1048, Yvert No 1366. 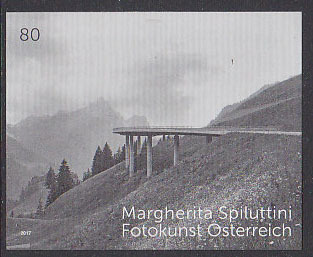 9765 EP AUSTRIA (1976) Bridge*. Black proof. Scott No 1044, Yvert No 1362. 10th anniversary of UNIDO. 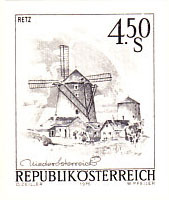 11884 EP AUSTRIA (1976) Windmill, Retz*. Black proof. Scott No 965, Yvert No 1348. 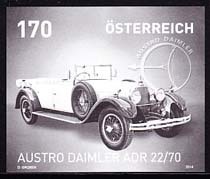 1125 EP AUSTRIA (1977) Attersee*. Black print. Scott No 1061, Yvert No 1383. 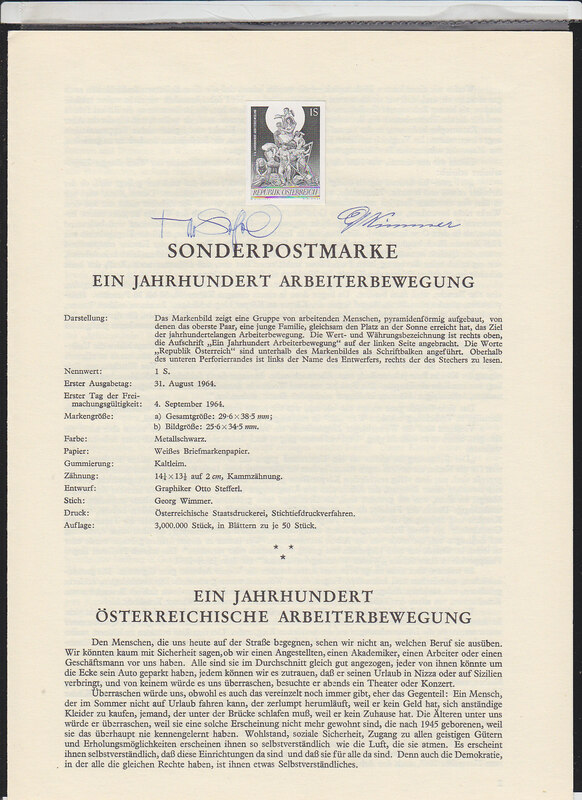 2799 EP AUSTRIA (1977) Papermakers Coat of Arms*. Black print. Scott No 1065, Yvert No 1387. 17th Confrerence of European Committee on Pulp & Paper Technology. 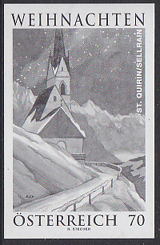 15226 EP AUSTRIA (1977) St. Stephen's Church*. Set of 3 black proofs. Scott Nos 1055-7, Yvert Nos 1373-5. Restoration of the church. 15283 EP AUSTRIA (1977) Alfred Hubin*. Black proof. Illustrated works of Poe and Dostoevsky. Scott No 1054, Yvert No 1372. 17014 EP AUSTRIA (1977) Nicholas Joseph von Jacquin*. Black proof. Botanist who first brought platinum and sugar cane to Austria and did seminal work on tropical fungi. Scott No 1051, Yvert No 1369. 3031 EP AUSTRIA (1978) Alpine Farm*. Black proof. Scott No 1077, Yvert No 1400. Woodcut by Lobisser. 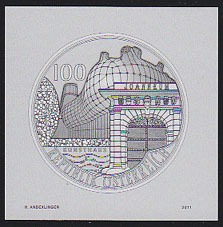 10088 EP AUSTRIA (1978) Riegersburg*. Black proof. Scott No 1079, Yvert No 1402. 10520 EP AUSTRIA (1978) Map of Europe*. Black proof. Scott No 1080, Yvert No 1403. 3rd Interparliamentary Conference for European Cooperation and Security. 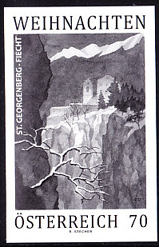 10755 EP AUSTRIA (1978) Archduke Johann shelter, Grossglockner*. Black proof. Scott No 1097, Yvert No 1422. 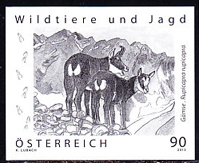 Austrian Alpine Club Centenary. 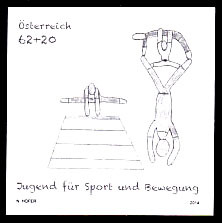 11790 EP AUSTRIA (1978) Hands bound together*. Black proof. Scott No 1099, Yvert No 1424. 30 anniversary Declaration of Universal Human Rights. 835 EP AUSTRIA (1979) Richard Zsigmondy*. Black print. Scott No 1133, Yvert No 1448. Nobel Prize for colloidal chemistry discoveries. 1088 EP AUSTRIA (1979) Burning match*. Black print. Scott No 1134, Yvert No 1452. Campaign to Save Energy. 1133 EP AUSTRIA (1979) Laurenz Koschler*. Black print. Scott No 1121, Yvert No 1437. 1692 EP AUSTRIA (1979) Diseased eye*. Blood vessels*. Black print. Scott No 1130, Yvert No 1447. 10th World Congress International Diabetes Federation. 2006 EP AUSTRIA (1979) August Musger*. Black print. Scott No 1140, Yvert No 1457. Developed slow-motion film techniques. 4618 EP AUSTRIA (1979) Population chart*. Angel*. 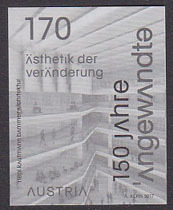 Black proof, 150th anniversary of Austrian Central Statistical Bureau. Scott No 1120, Yvert No 1436. 11217 EP AUSTRIA (1979) Steamships*. Set of 3 black proofs, 150th anniversary of first Danube Steamship Company. Scott Nos 1114-6, Yvert Nos 1430-2. Hard to find as a complete set! 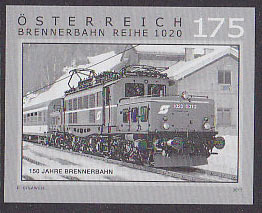 15453 EP AUSTRIA (1979) Diesel motor*. Black proof, 13th Congress on Internal Combustion Engines. Scott No 1122, Yvert No 1438. 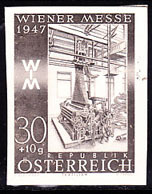 16922 EP AUSTRIA (1979) Steam printing press*. Black proof. Scott No 1132, Yvert No 1449. Slight pink stain. 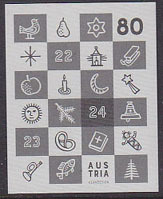 253 EP AUSTRIA (1980) Moon Figure*. Black print, art by Brandstatter. Scott No 1164, Yvert No 1484. 1136 EP AUSTRIA (1980) Robert Stolz*. Black print. Scott No 1162, Yvert No 1481. 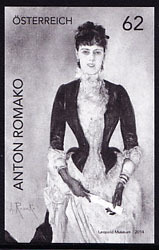 Operetta and musical comedy composer. 1694 EP AUSTRIA (1980) Arthritic hand* holding cane*. Black print. Scott No 1143, Yvert No 1462. Fight against rheumatism. 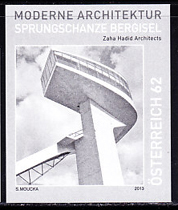 15781 EP AUSTRIA (1980) Old & Modern bridges*. Black proof. Scott No 1163, Yvert No 1483. 11th Congress International Association for Bridge and Structural Engineering. 15927 EP AUSTRIA (1980) Man and woman in tub*. Black proof. Scott No 1142, Yvert No 1460. 500th anniversary of Baden. 16980 EP AUSTRIA (1980) Bible Illustration*. Black proof. Scott No 1161, Yvert No 1482. 10th International Congress for Organization of Old Testament Studies. 45 EP AUSTRIA (1981) Bearskin manuscript*. Black print. Scott No 1177, Yvert No 1499. Azzo (founder of house of Kuenringer) and his followers. 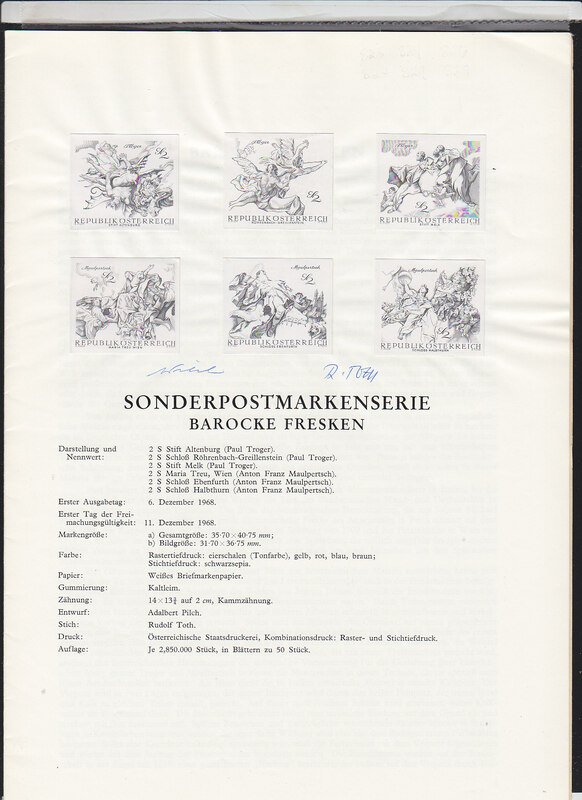 997 EP AUSTRIA (1981) "Nibelung Saga" by Dachauer*. Black print. Scott No 1173, Yvert No 1495. Centenary of Dachauer's birth. 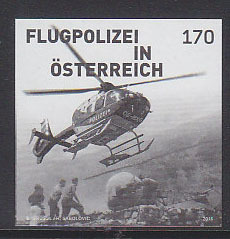 1140 EP AUSTRIA (1981) Maypole*. Black print. Scott No 1178, Yvert No 1500. 1206 EP AUSTRIA (1981) "The Frog King"*. Black print. Scott No 1181, Yvert No 1503. 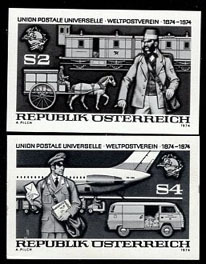 1717 EP AUSTRIA (1981) Scale*. Black print. Scott No 1185, Yvert No 1507. International Pharmaceutical Federation World Congress. 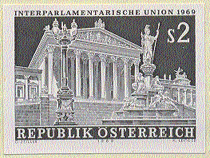 2247 EP AUSTRIA (1981) Johann Florian Heller*. Black print. Scott No 1183, Yvert No 1505. Pioneer of urinalysis. 11th International Clinical Chemistry Congress. 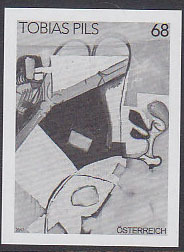 16557 EP AUSTRIA (1981) Escher's "Impossible" Cube*. Black print. Scott No 1187, Yvert No 1509. 10th International Mathematicians Congress. 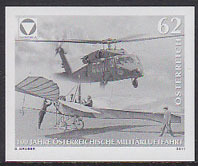 47 EP AUSTRIA (1982) Beaver*. Black print. Scott No 1222, Yvert No 1547. Endangered Species. 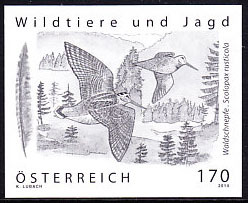 578 EP AUSTRIA (1982a) Bustard*. Black print. Scott No 1221, Yvert No 1546. Endangered Species. 579 EP AUSTRIA (1982b) Capercaillie*. Black print. Scott No 1223, Yvert No 1548. Endangered Species. 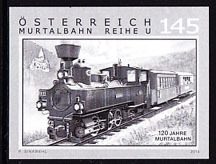 1142 EP AUSTRIA (1982) Horse-drawn railcar*. Black print. Scott No 1217, Yvert No 1541. 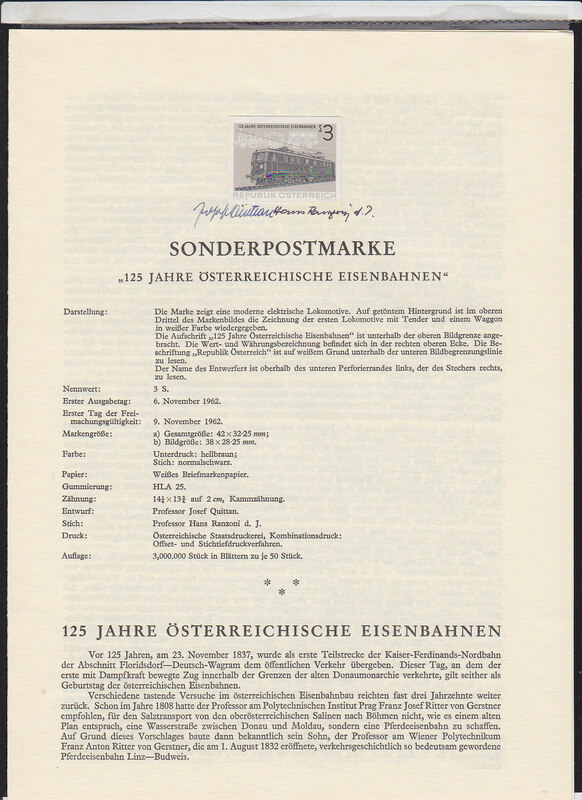 Sesquicentennial of Linz-Freistadt-Budweis Horse-drawn Railroad. 1711 EP AUSTRIA (1982) St. Apollonia*. Black print. Scott No 1225, Yvert No 1550. 70th annual World Congress of Dentists. 1912 EP AUSTRIA (1982a) Haydn*. Black print. Scott No 1210, Yvert No 1532. Haydn and His Time Exhibition. 2356 EP AUSTRIA (1982) Rocket lifting off*. Black print. Scott No 1219, Yvert No 1544. 2nd UN Conference on Peaceful Uses of Outer Space. I think this is the first Austrian space issue! 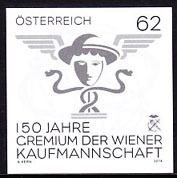 1572 EP AUSTRIA (1983) Kiwanis emblem*. Black print. Scott No 1246, Yvert No 1573. Kiwanis International Convention. 1698 EP AUSTRIA (1983) Petri dish*. Black print. Scott No 1250, Yvert No 1577. Penicillin test on cancer. 13th International Chemotherapy Congress. 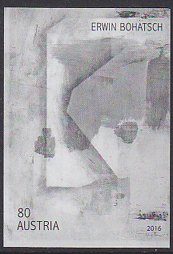 2249 EP AUSTRIA (1983a) Karl von Terzaghi*. Black print. Scott No 1255, Yvert No 1582. Founder of Scientific Subterranean engineering and the father of soil mechanics. 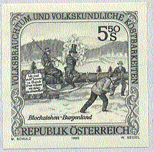 16053 EP AUSTRIA (1983) Viktor Franz Hess*. Black proof. Scott No 1245, Yvert No 1572. Nobel Prize in physics for discovery of cosmic radiation. 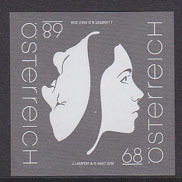 16362 EP AUTRICHE (1983) Coeur*. Électrocardiogramme*. Épreuve en noir non dentelé. Symposium mondial sur les stimulateurs cardiaques. Yvert No 1566, Scott No 1240. Très beau! 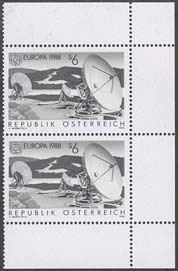 16592 EP AUSTRIA (1983) Globe*. Black proof. 7th World Congress of Psychiatry. Scott No 1247, Yvert No 1574. 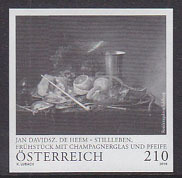 16721 EP AUSTRIA (1983) Josef Hauer*. Black proof. Scott No 1235, Yvert No 1550. 12 tone disciple of Schoenberg. 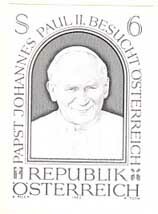 16882 EP AUSTRIA (1983) John Paul II*. Black proof. Scott No 1252, Yvert No 1580. Visit to Austria. 15236 EP AUSTRIA (1984) Eiffel tower*. Leaning tower of Pisa*. Ferris wheel*. Black proof. Minimumdus model city. Scott No 1282, Yvert No 1612. 15461 EP AUSTRIA (1984) Tire*. Black proof. Automobile Engineers World Congress. Scott No 1271, Yvert No 1599. 16054 EP AUSTRIA (1984) Bridge*. Black proof. Scott No 1272, Yvert No 1601. 16348 EP AUSTRIA (1984) Dionysus*. Black proof. Mosaic in Virinum. Scott No 1277, Yvert No 1609. 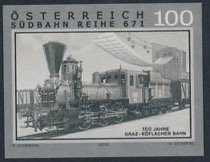 17702 EP AUTRICHE (1984) Trains*. Séries de 2 épreuves en noir non dentelé. Yvert Nos 1615-6, Scott Nos 1289-90. Très beau! 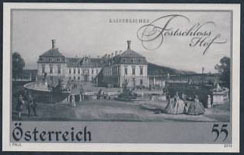 17853 EP AUSTRIA (1984) Lake Neusiedl*. Geese*. Black proof. Austria's largest steppe lake. Scott No 1284, Yvert No 1617. 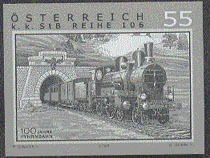 15783 EP AUSTRIA (1985) Hundsau brook aqueduct*. Black proof. Scott No 1332, Yvert No 1662. 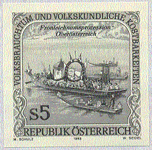 15858 EP AUSTRIA (1985) Chessboard on globe*. Black proof. World Chess Federation Congress. Scott No 1323, Yvert No 1652. 16055 EP AUSTRIA (1985) Johann Josef Fux*. Violin*. Trombone*. Black proof. Author of manual on composition "Gradus Ad Parnassum. Scott No 1311, Yvert No 1640. 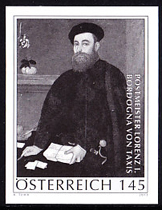 16594 EP AUSTRIA (1985) Lorenz Bohler*. Black proof. Creator of modern accident surgery. Scott No 1300, Yvert No 1629. 16722 EP AUSTRIA (1985) Alban Berg*. Black proof. Scott No 1303, Yvert No 1632. 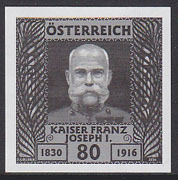 17016 EP AUSTRIA (1985) Josef Stefan*. Black proof. Developed DC and Ac current techniques. Cofounded Viennese school of physics. Established standard orchestral pitch for "A". Developed formula for black body radiation with pupil Boltzmann. Scott No 1307, Yvert No 1636. 17017 EP AUSTRIA (1985) Hanns Horbiger*. Black proof. Refrigeration engineer whose work lead to air conditioning. Also proposed wierd cosmological theory that the universe originated as an enormous glowing mass collided with a smaller mass of ice (Welteislehre). Scott No 1331, Yvert No 1661." 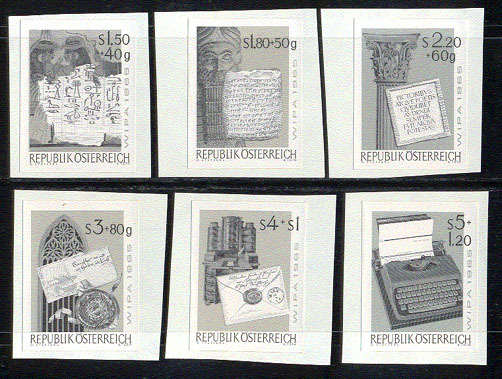 10090 EP AUSTRIA (1986) Admission to Council of Europe*. Black proof. Scott No 1340, Yvert No 1671. 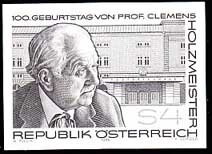 15204 EP AUSTRIA (1986) Clemens Holzmeister*. Black proof. Scott No 1341, Yvert No 1672. Architect and stage designer. 16056 EP AUSTRIA (1986) Pasque flower*. Black proof. Scott No 1346, Yvert No 1676. 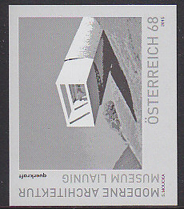 16633 EP AUSTRIA (1986) Sonnblick observatory*. Black proof. Scott No 1359, Yvert No 1686. 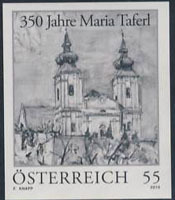 16655 EP AUSTRIA (1986) Antimonite*. Black proof. Scott No 1348, Yvert No 1679. 17631 EP AUSTRIA (1986) Geotextiles Congress*. Black proof. Scott No 1342, Yvert No 1673. 1156 EP AUSTRIA (1988) Communications dish*. Pair of black prints privately perforated and gummed. Scott No 1429, Yvert No 1751. Unusual discovery! 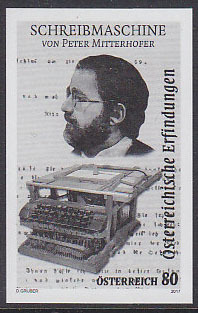 836 EP AUSTRIA (1989) Friedrich Emich*. Black print. Founder of modern microchemistry. Scott No 1489, Yvert No 1810. 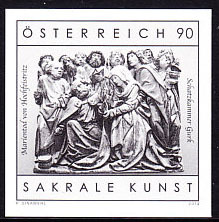 15311 EP AUSTRIA (1993) "Easter" by Max Weilor*. Black proof. Scott No 1628, Yvert No 1938. 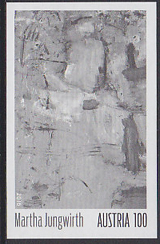 16706 EP AUSTRIA (1993) "Strada del Sol"*. Black proof. Popular entertainers. Scott No 1592, Yvert No 1921. 16707 EP AUSTRIA (1993) "Granny" by Ludwig Hirsch*. Black proof. Austrian pop music. Scott No 1626, Yvert No 1935. 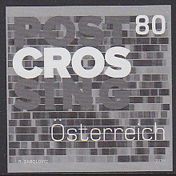 16708 EP AUSTRIA (1993) Vienna Music Choral Society*. Black proof. Scott No 1627, Yvert No 1936. 16987 EP AUSTRIA (1993) Corpus Christi procession*. Black proof. Scott No 1619, Yvert No 1944. 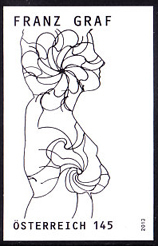 17746 EP AUSTRIA (1993) Drawing of decorated log*. Black proof. Scott No 1620, Yvert No 1945. 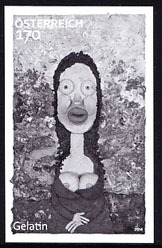 15317 EP AUSTRIA (1994) "Lying Lady"*. Black proof. Painting by Boeckl. Scott No 1638, Yvert No 1949. 15318 EP AUSTRIA (1994) Allegory of Theology, Jurisprudence and Medicine*. Black proof. 300th anniversary of birth of Daniel Gran. Scott No 1642, Yvert No 1954. 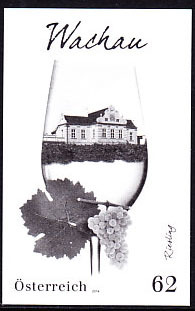 15319 EP AUSTRIA (1994) "Head" by Franz Ringel*. Black proof. Scott No 1663, Yvert No 1968. 16058 EP AUSTRIA (1994) Lake Rudolph expedition*. Black proof. Europa issue. Scott No 1641, Yvert No 1955. 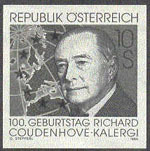 16059 EP AUSTRIA (1994) Richard Coudenhove Kalergi*. Black proof. Kalergi was the founder of the Pan-European Union. Scott No 1665, Yvert No 1972. 16060 EP AUSTRIA (1994) Austrian, EU Flags*. Black proof. Austria joining European Union. Scott No 1667, Yvert No 1974. 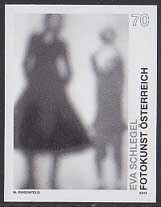 16328 EP AUSTRIA (1994) Dolls*. Cradle*. Black proof. Scott No 1633, Yvert No 1944. 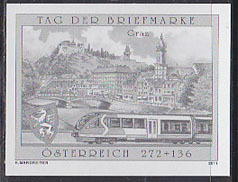 16329 EP AUSTRIA (1994) Sled of Steiermark*. Black proof. Scott No 1634, Yvert No 1945. 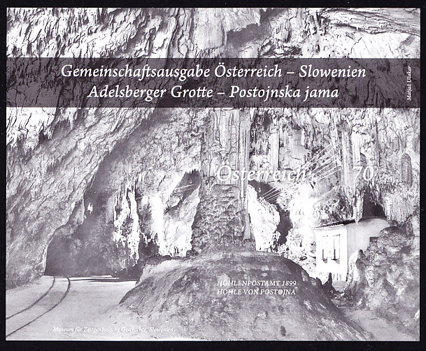 17375 EP AUSTRIA (1994) Peggau Cave, Styria*. Black proof. Scott No 1496, Yvert No 1952. 15039 EP AUSTRIA (1995) Vineyard watchman's costume*. Black proof. Folklore & Costumes issue. Scott No 1672, Yvert No 1979. 15040 EP AUSTRIA (1995) Grapes*. Bonnet*. Black proof. Folklore & Costumes issue, Wachau, Lower Austria. Scott No 1673, Yvert No 1980. 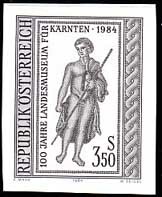 15323 EP AUSTRIA (1995) "Europaisches Landschaftsbild" by Frohner*. Black proof. Scott No 1685, Yvert No 1995. 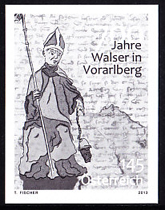 15362 EP AUSTRIA (1995) St. Gebhard*. Black proof. Stained glass window by Martin Hausle. Scott No 1680, Yvert No 1990. 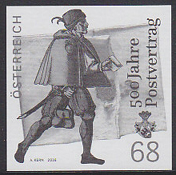 15855 EP AUSTRIA (1995) Josef Loschmidt*. Black proof. Loschmidt first determined the diameter of a molecule using the kinetic theory of gases. Scott No 1682, Yvert No 1992. 15966 EP AUSTRIA (1995) Belt*. Black proof. 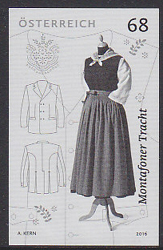 Folklore & Costumes issue - Gailtlal, Carinthia. Scott No 1671, Yvert No 1978. 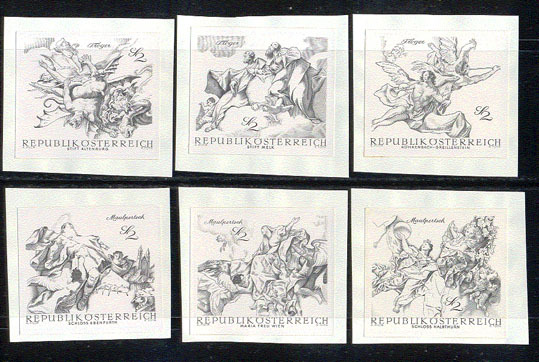 16062 EP AUSTRIA (1995) Flags*. Black proof. 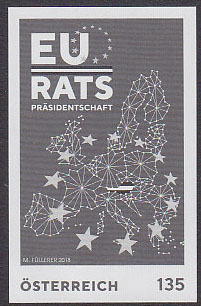 Membership in European Union. Scott No 1667, Yvert No 1974. 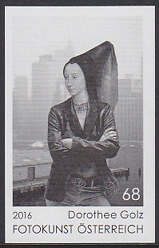 16776 EP AUSTRIA (1995) Nico Dostal*. The Hungarian Wedding*. Black proof. Scott No 1687, Yvert No 1998. 15329 EP AUSTRIA (1996) "Power Station" by Reinhart Artberg*. Black proof. Scott No 1711, Yvert No 2034. 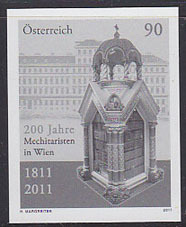 16730 EP AUSTRIA (1996) Organ pipes*. Music score*. Black proof. Anton Bruckner. Scott No 1700, Yvert No 2013. 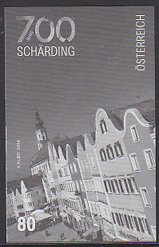 15331 EP AUSTRIA (1997) "House in Wind" by Schickhofer*. Black proof. Scott No 1737, Yvert No 2062. 16777 EP AUSTRIA (1997) Scene from "The Dead City" by Korngold*. Black proof. Scott No 1719, Yvert No 2042. 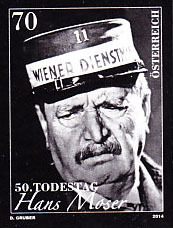 17642 EP AUSTRIA (1997) Oscar Werner, actor*. Black proof. Scott No 1740, Yvert No 2065. 16064 EP AUSTRIA (1998) Austrian Presidency of EU*. Black proof. Scott No 1766, Yvert No 2090. 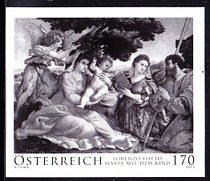 16731 EP AUSTRIA (1998) Eisenstadt*. Black proof. Haydn spent 30 years here. Scott No 1772, Yvert No 2096. 16991 EP AUSTRIA (1998) St. Konrad collecting spring water*. Erns castle*. Black proof. Scott No 1762, Yvert No 2085. 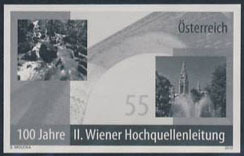 17523 EP AUSTRIA (1998) Vienna Fiacre*. Ferris wheel*. Black proof. Scott No 1752, Yvert No 2080. 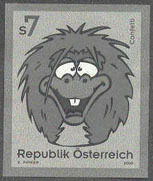 15816 EP AUSTRIA (2000) Cartoon bird*. Black proof. Confetti. Scott No 1820. 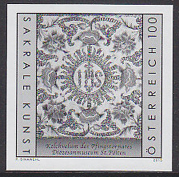 16097 EP AUSTRIA (2000a) Basilisk*. Mirror*. Black proof. Scott No 1804. 16098 EP AUSTRIA (2000b) Witch's Ride*. Black proof. Scott No 1810. 16099 EP AUSTRIA (2000c) Bread Loaf Monument*. Black proof. Scott No 1811. 16341 EP AUSTRIA (2000) Sonnblick glacier*. Black proof. Scott No 1813. 16709 EP AUSTRIA (2000) Violin*. Black proof. 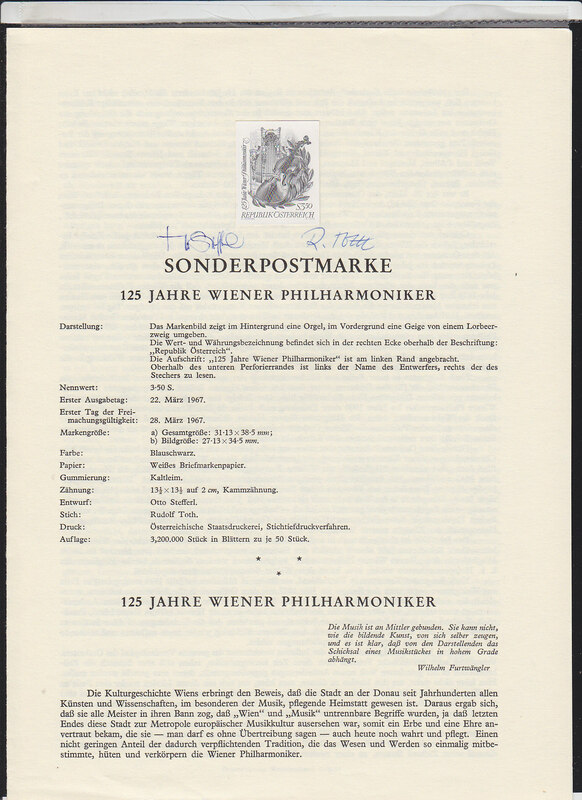 Centenary of Vienna Philharmonic. Scott No 1825. 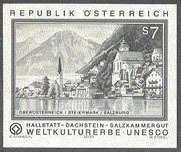 17808 EP AUSTRIA (2000) Hallstadt-Dachstein*. Salzkammergut*. Black proof. UNESCO World Heritage Site. Scott No 1826. 15030 EP AUSTRIA (2001) Boat mill*. Black proof. Scott No 1838. 15817 EP AUSTRIA (2001) Cartoon dog*. Black proof. 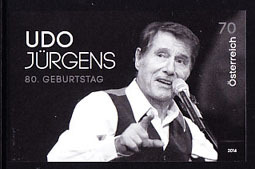 Rolf Rüdiger. Scott No 1841. 16065 EP AUSTRIA (2001) Leaf*. Black proof. Scott No 1844. 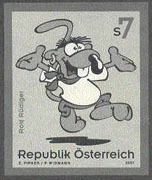 17402 EP AUSTRIA (2001) Stylized animal walking*. Black proof. 7th IVV Hiking Olympics. Scott No 1848. 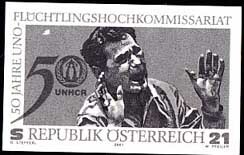 17787 EP AUSTRIA (2001) Refugees commissioner*. Black proof. Scott No 1847. 10142 EP AUSTRIA (2002) Schonlaterngasse*. Black proof. House of the Basilisk in Vienna. Scott No 1867. 2767 EP AUSTRIA (2006) Steam locomotive*. Black print. Pyhrnbahn. 3283 EP AUSTRIA (2007) Portrait of a lady by Cottignola*. Black print. Liechtenstein museum. 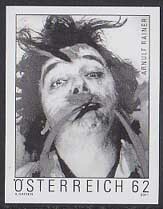 3284 EP AUSTRIA (2007) Art by Hermann Nitsch*. Black print. 4226 EP AUSTRIA (2007) Spring flowers*. Black print. 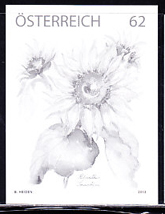 4227 EP AUSTRIA (2007) Violet*. Black print. 4251 EP AUSTRIA (2007) Rose*. Black print. Mourning. 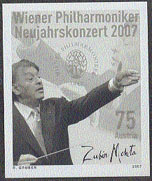 4809 EP AUSTRIA (2007) Zubin Mehta*. New Year's Concert*. Black print. 4941 EP AUSTRIA (2007) Mariazell*. Black print. 850th anniversary. 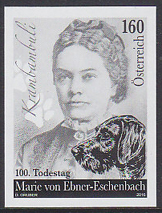 5186 EP AUSTRIA (2007) Klemens Maria Hofbauer*. Black print. 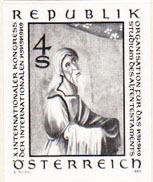 Patron saint of Vienna. 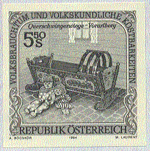 5187 EP AUSTRIA (2007) Easter Rattles*. Bell*. Black print. 5514 EP AUSTRIA (2007) WIPA 2008*. Black print. 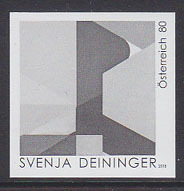 Triangular stamp. 5754 EP AUSTRIA (2007) Battered woman*. Black print. End of violence against women. 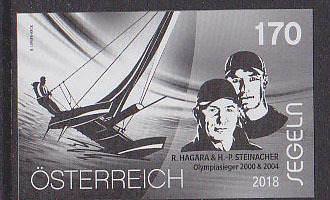 6336 EP AUSTRIA (2007) Filigreed key*. Black print. Metalwork of Michael Blumelhuber demonstrating Ajoure technique. 8000 EP AUSTRIA (2007) Host of TV show "Wetten, daas"*. Black print. Arguably Europe's most popular game show. 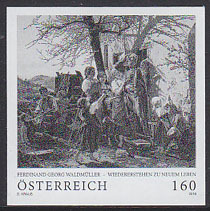 6338 EP AUSTRIA (2008) Painting from Liechtenstein museum*. Black print. 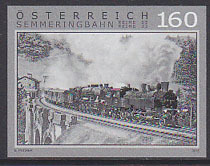 6339 EP AUSTRIA (2008) Painting by Soshana*. Black print. Modern art in Austria. 6535 EP AUSTRIA (2008) Austrian airlines 50th anniversary*. Black print. 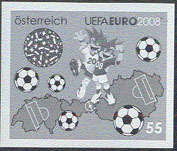 8349 EP AUSTRIA (2008) Various cities hosting UEFA EUro2008*. 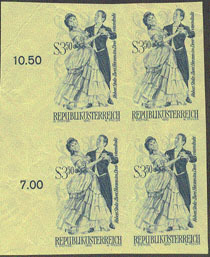 Black print of minisheet of 8 stamps. 8350 EP AUSTRIA (2008) "Defence" by Lassnig*. Black print. 8351 EP AUSTRIA (2008) Cartoon characters playing soccer*. 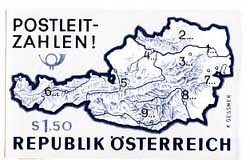 Map of Austria*. Black print. 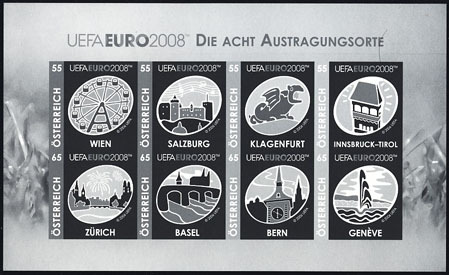 EURO2008. 8352 EP AUSTRIA (2008) Soccer ball surrounded by stars*. Map of Europe*. Black print. EURO2008. 8353 EP AUSTRIA (2008) Player's foot on soccer ball*. Black print. 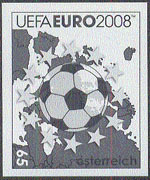 EURO2008. 8452 EP AUSTRIA (2008) WIPA*. 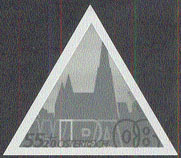 Black print of minisheet of 3 triangular stamps. 8453 EP AUSTRIA (2008) WIPA*. Black print. 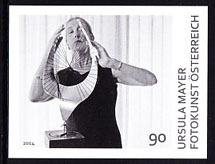 Triangular stamp. 1973 EP AUSTRIA (2010) Painting by Koch of Tyrolean Land Army*. Black print of S/S. 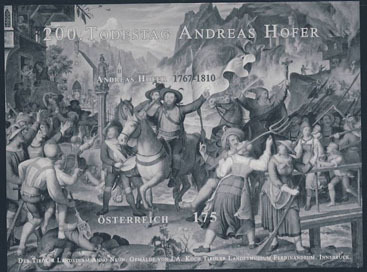 200th anniversary of death of Andreas Hofer, Tyrolean patriot who defeated Napoleon. 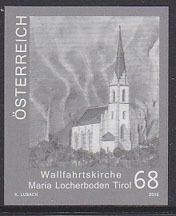 6204 EP AUSTRIA (2010) Maria Teferl basilica*. Black print. 350th anniversary. 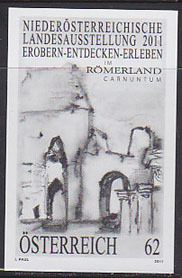 6205 EP AUSTRIA (2010) Palatine church of Karnburg*. Black print. 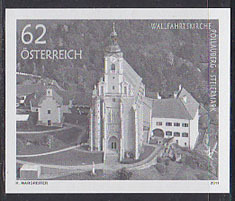 6206 EP AUSTRIA (2010) Church*. Black print. 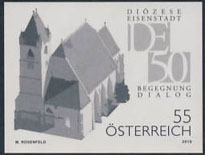 50th anniversary of founding of diocese of Eisenstadt. 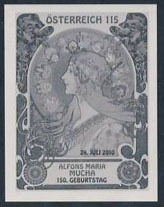 6340 EP AUSTRIA (2010) Alphonse Mucha*. Black print. Czech Art Nouveau painter. 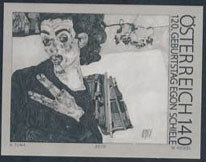 6341 EP AUSTRIA (2010) Egon Schiele*. Black print. 120th birth day of Austrian painter considered successor to Klimt. 6843 EP AUSTRIA (2010) Imperial Festival Palace Hof*. Black print. 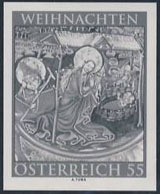 6938 EP AUSTRIA (2010) Manger scene*. Black print. 7209 EP AUSTRIA (2010) Rainbow Parade*. Black print. 15th year. 7384 EP AUSTRIA (2010) Desk*. Black print. Modern design by Peter Zuchi. 7781 EP AUSTRIA (2010) Mask*. Castle*. Black print. 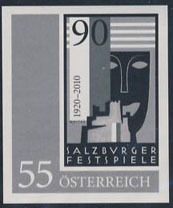 90th Salzburg Festival. 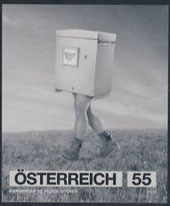 7958 EP AUSTRIA (2010) Walking mailbox*. Black print. 8104 EP AUSTRIA (2010) Gebhard's crosier*. Black print. Religious Art in Austria. 8105 EP AUSTRIA (2010) Crucifix*. Black print. Religious Art in Austria. 8322 EP AUSTRIA (2010) Linger brothers*. Luge*. Black print. Double gold medalists at Vancouver Olympics. 8623 EP AUSTRIA (2010) Type 199 locomotive*. Black print. 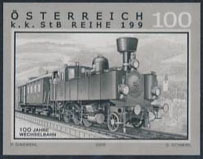 100 years of Wechsel Railway. 8624 EP AUSTRIA (2010) Ancient locomotive*. Black print. 125 years of Frontier Railway. 8625 EP AUSTRIA (2010) Austrian railjet*. Black print. Stamp Day. 8626 EP AUSTRIA (2010) Ancient locomotive*. Black print. 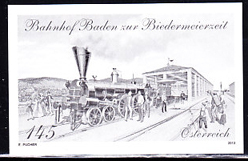 150th anniversary of Graf-Koflach Railway. 8688 EP AUSTRIA (2010) Vienna Old Town Centre*. Black print. 8757 EP AUSTRIA (2010) Maria Theresa*. Black print. 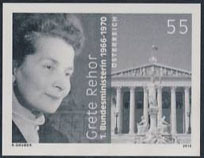 8759 EP AUSTRIA (2010) Grete Rehor*. Black print. First female minister for Austria. 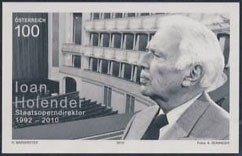 10844 EP AUSTRIA (2010) Ioan Holender*. Black print. Director of Vienna State Opera. 10917 EP AUSTRIA (2010) Ancient Prague*. Black print. 6342 EP AUSTRIA (2011) Aqueduct*. Black print. 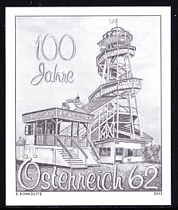 120th anniversary of 2nd Viennese Mountain Spring Pipeline. 9253 EP AUSTRIA (2011) Pollauberg pilgrimage church*. Black print. 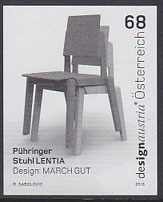 9340 EP AUSTRIA (2011) 20th anniversary Kunsthaus Wien*. Black print. 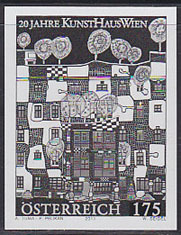 9341 EP AUSTRIA (2011) Painting by Hundertwasser*. Black print. 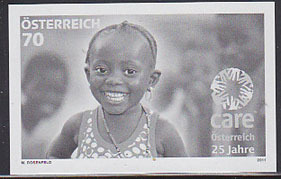 9908 EP AUSTRIA (2011) African child*. 25 years of CARE*. Black print. 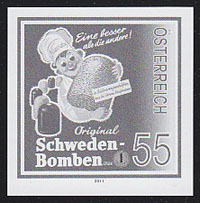 10318 EP AUSTRIA (2011) Original Schweden-Bomben*. Black print. 10352 EP AUSTRIA (2011) Roman ruins in Carnuntum*. Black print. 11107 EP AUSTRIA (2011) Mechitarist monastery in Vienna*. Black print. 11541 EP AUSTRIA (2011) Graz*. High speed train*. Black print. 11722 EP AUSTRIA (2011) Forest*. Elk*. Pheasant*. Badger*. Black print - Year of Forestry issue. 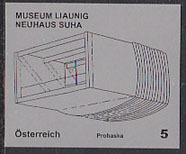 15213 EP AUSTRIA (2011) Liaunig Museum*. Black print. 15233 EP AUSTRIA (2011) St. Quirin mountain church*. Black print. 15333 EP AUSTRIA (2011) "Fear" by Arnulf Rainer*. Black print. 15534 EP AUSTRIA (2011) Military helicopter*. Early plane*. Black print. 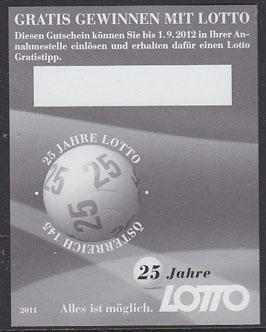 16335 EP AUSTRIA (2011) Scratch-off strip*. Lottery ball*. Black print. 25th anniversary of lottery. 16399 EP AUSTRIA (2011) Loisium hotel*. Black print. 16663 EP AUSTRIA (2011) KTM 125 D.O.C.H. "Apfelbeck"*. Black print. 16814 EP AUSTRIA (2011) Photograph by Eva Schlegel*. Black print. 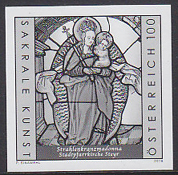 16992 EP AUSTRIA (2011) St. Christopher brotherhood*. Black print. 625th anniversary. 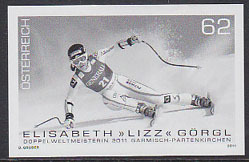 17492 EP AUSTRIA (2011) Elisabeth Gorgl*. Black print. 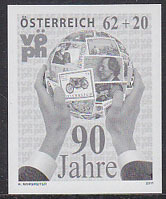 17542 EP AUSTRIA (2011) Hand holding globe covered with stamps*. Black print. 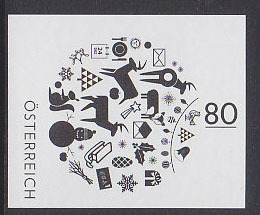 90th anniversary of Austrian Philatelist Societies. 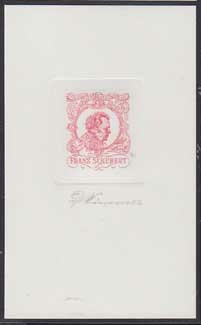 17643 EP AUSTRIA (2011) Ferdinand Raimund*. Black print. 175th anniversary of death of comedian and actor. 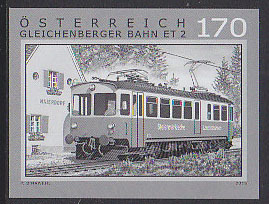 17709 EP AUSTRIA (2011) Erzburg railway*. Black print. 17710 EP AUSTRIA (2011) Vienna West station*. Black print. 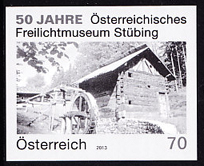 3035 EP AUSTRIA (2013) Stubing open air museum. Black print. Traditional peasant culture of Austria. 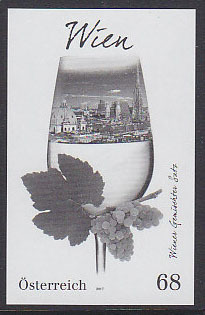 3049 EP AUSTRIA (2013) Wine glass. Windmill. Black print. 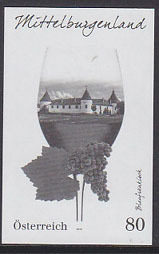 Styrian wine region. 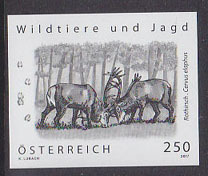 3190 EP AUSTRIA (2013) Chamois buck & doe*. Black print. Wildlife & hunting series. 3221 EP AUSTRIA (2013) Bergisel ski jump, Innsbruck*. Black print. Modern architecture series. 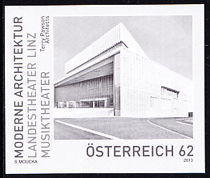 3222 EP AUSTRIA (2013) Landestheater Linz. Musiktheater. Black print. Modern architecture series. 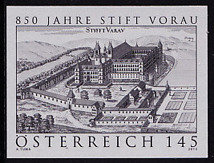 3230 EP AUSTRIA (2013) Augustinian monastery - Vorau - 850th anniversary. Black print. 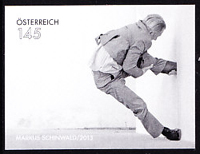 3285 EP AUSTRIA (2013) Franz West. Black print. 3286 EP AUSTRIA (2013) Self portrait by Richard Gerstl. Black print. 3287 EP AUSTRIA (2013) Graphic design*. Black print. 20 Reasons to Love Europe. 3854 EP AUSTRIA (2013) Blue bird. Otter. Black print. 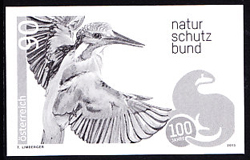 Austrian Conservation Federation 100th anniversary. 3952 EP AUSTRIA (2013) Electric ship. Electric rail*. Black print of SS. 100th anniversary of Star & Hafferl. 3962 EP AUSTRIA (2013) Youth hugging tree. Black print. 4229 EP AUSTRIA (2013) Sunflower*. Black print. 4230 EP AUSTRIA (2013) Echinacea*. Black print. Medicinal flower used to treat infections. 4285 EP AUSTRIA (2013) Various foods. Black print. 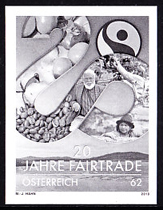 20th anniversary of Austrian FAIRTRADE. 4286 EP AUSTRIA (2013) Yummy desserts. Black print. 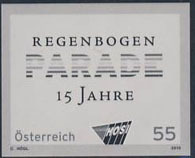 4325 EP AUSTRIA (2013) Toboggan ride. Black print. 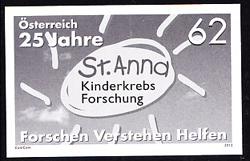 4684 EP AUSTRIA (2013) St. Anna's Children's Hospital 25th anniversary. Black print. 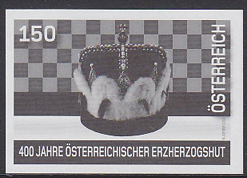 4765 EP AUSTRIA (2013) 1953 HMW Z50 B.J.*. Black print. 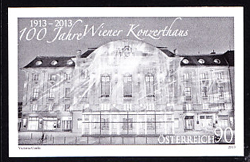 4810 EP AUSTRIA (2013) Vienna concerthouse 100th anniversary. Black print. 4942 EP AUSTRIA (2013) Ancient town Laidbach (Ljubljana). Tram. Black print. 5026 EP AUSTRIA (2013) Lawrence Borgdana. Black print. Postmaster of Taxis. 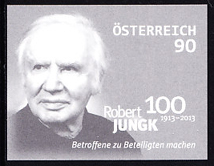 5035 EP AUSTRIA (2013) Robert Jungk. Black print. Jewish journalist who wrote about nuclear weapons. 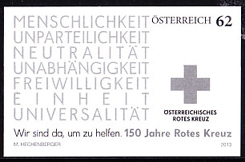 5107 EP AUSTRIA (2013) Red Cross 150th anniversary. Black print. 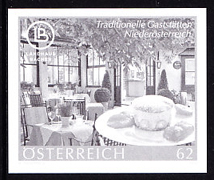 5188 EP AUSTRIA (2013) Bishop. Walser settlements 700th anniversary. Black print. 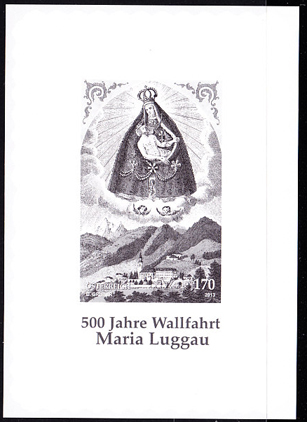 5189 EP AUSTRIA (2013) Shrine of Maria Luggau (500th anniversary)*. Black print of SS. 5190 EP AUSTRIA (2013) Christ rising from the grave*. Black print. St. Florian monastery illumination. 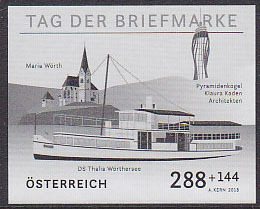 5262 EP AUSTRIA (2013) Paddle steamer "Hohentweil". Black print. Featured in the James Bond film "Quantum of Solace." 5311 EP AUSTRIA (2013) Postojna cave*. Black print of SS. 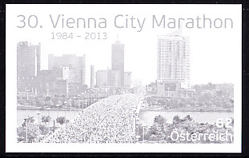 5332 EP AUSTRIA (2013) 30th Vienna marathon. Black print. 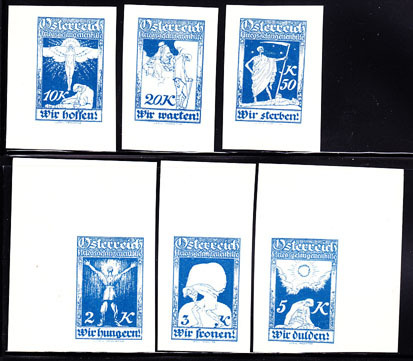 5450 EP AUSTRIA (2013) Paintings by Attersee*. 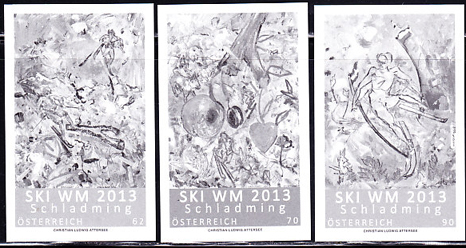 Set of 3 black prints commemorating 42nd Alpine World Ski Championships. 5606 EP AUSTRIA (2013) 1846 Bruck locomotive, Baden*. Black print. Biedermeier period. 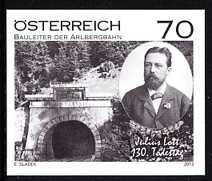 5607 EP AUSTRIA (2013) Julius Lott. Railway tunnel. Black print. 6207 EP AUSTRIA (2013) Monastery of St. George-Fiecht, one of the two oldest in North Tyrol. Black print. 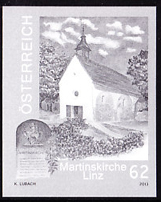 6208 EP AUSTRIA (2013) Martin church in Linz. 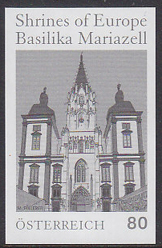 It is regarded as one of the oldest religious buildings in Austria. Black print. 6343 EP AUSTRIA (2013) Still image from the video art work "Orient, 1st part". The work of Schinwald, one of the internationally most recognized artists of his generation. Black print. 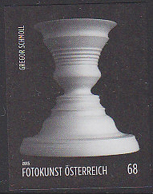 6344 EP AUSTRIA (2013) Contemporary art of Franz Graf. Black print. 6572 EP AUSTRIA (2013) First waterproof mascara. Black print. 6939 EP AUSTRIA (2013) Detail from neo-Gothic high altar of the parish church of St. Michael . Black print. 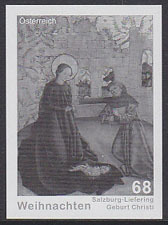 6940 EP AUSTRIA (2013) "Mary with Infant" by Lotto. Black print. 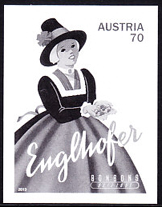 7036 EP AUSTRIA (2013) Woman in costume - Engelhofer trademark. Black print. 7037 EP AUSTRIA (2013) Traditional costumes. Black print. 7229 EP AUSTRIA (2013) Volunteer fire brigade 150th anniversary. Black print. 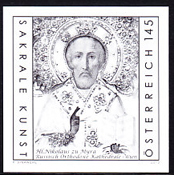 8106 EP AUSTRIA (2013) Icon of St. Nicholas of Myra. Black print. 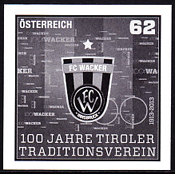 8360 EP AUSTRIA (2013) Soccer club - FC Wacker. Black print. 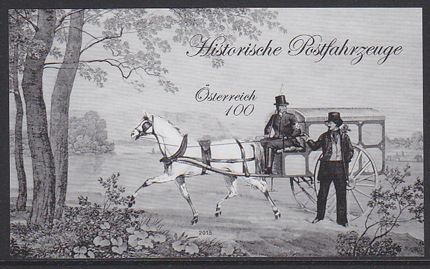 8392 EP AUSTRIA (2013) Historic postal stagecoach. Black print of S/S. 8419 EP AUSTRIA (2013) Salzkammergut Localbahn. Black print. 8544 EP AUSTRIA (2013) Burgtheatre on the Ringstrasse. Black print. 8630 EP AUSTRIA (2013) Aussenfern railway. Black print. 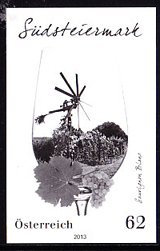 9049 EP AUSTRIA (2014) Glass of Riesling wine. Black print. 9234 EP AUSTRIA (2014) Museum of Applied/Contemporary Arts. Black print. 150th anniversary. 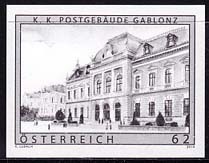 9235 EP AUSTRIA (2014) Gablonz post office. Black print. 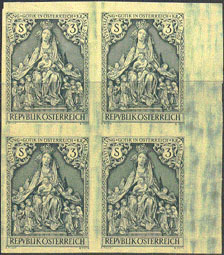 Old Austria series. 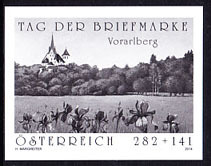 9254 EP AUSTRIA (2014) Klosterneuburg monastery. Black print. 900th anniversary. 9342 EP AUSTRIA (2014) "Redrawing Austria". Black print. A color-by-numbers collective artwork! 9372 EP AUSTRIA (2014) Death of the Virgin. Black print. Multicolor wooden reflief from the early 16th century . 9503 EP AUSTRIA (2014) Austro Daimler ADR 22/70. Black print. 9711 EP AUSTRIA (2014) European woodcock. Black print. Wildlife and hunting series. 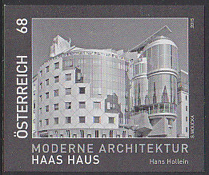 9945 EP AUSTRIA (2014) Hans Moser. Black print. Actor mainly in comedy films. 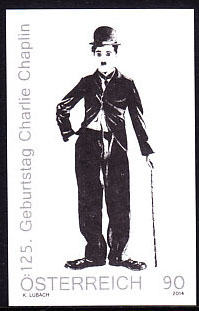 9946 EP AUSTRIA (2014) Charlie Chaplin. Black print. 9964 EP AUSTRIA (2014) Josef Madersperger. Sewing machine. Black print. TaIlor who improved the sewing machine. 10097 EP AUSTRIA (2014) EU flag. Dove. Black print. 20th anniversary of Austria's accession to EU. 10242 EP AUSTRIA (2014) Dog's-tooth violet (Erythronium dens-canis). Black print. 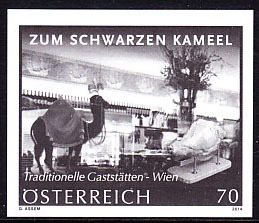 10319 EP AUSTRIA (2014) Black camel. Restaurant. Black print. Traditional Viennese restaurant. 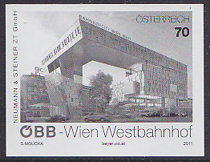 10674 EP AUSTRIA (2014) Hospital of Merciful Brothers 400th anniversary. Black print. 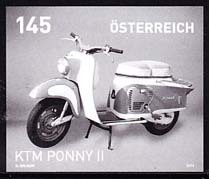 10745 EP AUSTRIA (2014) KTM Ponny II. Black print. 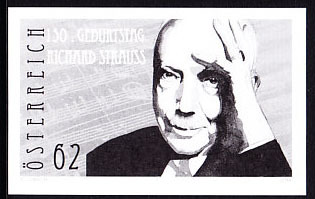 10803 EP AUSTRIA (2014) Richard Strauss. Black print. Noted for his tone poems. 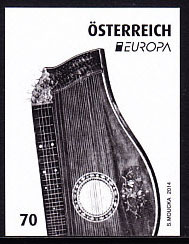 10839 EP AUSTRIA (2014) Zither. Black print. Traditional alpine instrument. 10840 EP AUSTRIA (2014) Vienna Contrabass. Black print. 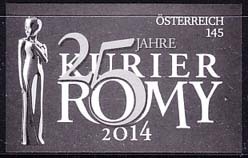 11037 EP AUSTRIA (2014) Kurier Romy award 25th anniversary. Black print. 11247 EP AUSTRIA (2014) Steamboat on Lake Atterlee. Black print. 175th anniversary of first steamship on lake. 11338 EP AUSTRIA (2014) Youth sport and exercise Black print. 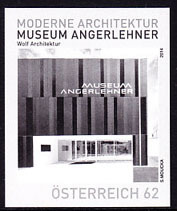 15334 EP AUSTRIA (2014) Angerlehner art museum. Black print. 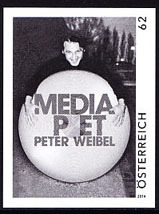 15335 EP AUSTRIA (2014) Contemporary art of Peter Weibel. Black print. 15336 EP AUSTRIA (2014) Young art in Austria by Quartet. Black print. 15358 EP AUSTRIA (2014) Sculpture by Ursula Mayer. Black print. 15359 EP AUSTRIA (2014) Modern art in Austria - Anton Reisser. Black print. 15898 EP AUSTRIA (2014) Christmas 2014. Set of 2 black prints. 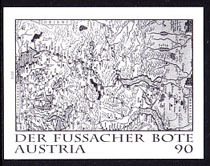 16519 EP AUSTRIA (2014) Map of Fussach area. Black print. 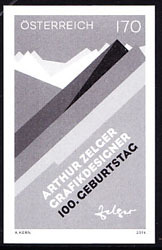 16682 EP AUSTRIA (2014) Stylised mountains - poster by Arthur Zelger. Black print. 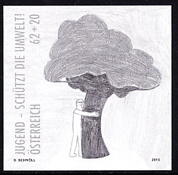 16711 EP AUSTRIA (2014) Udo Jergens. Black print. 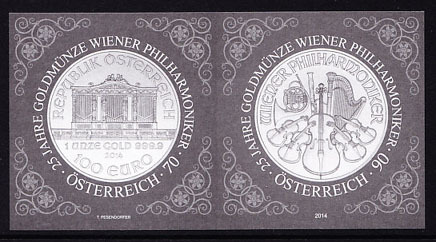 16712 EP AUSTRIA (2014) Vienna Philharmonic 25 years gold. Set of 2 black prints as tête-bêche pair. 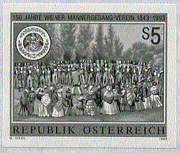 16889 EP AUSTRIA (2014) Austria post sales team 150th anniversary. Black print. 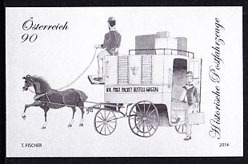 17524 EP AUSTRIA (2014) Parcel post cart. Black print. 17529 EP AUSTRIA (2014) Siberian iris. Basilica of Rankweil. Black print. 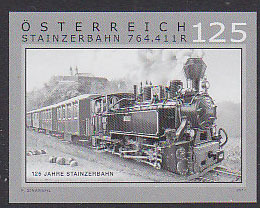 17711 EP AUSTRIA (2014) Steyrtalban. 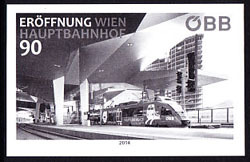 Black print of S.S.
17712 EP AUSTRIA (2014) Vienna central station. Black print. 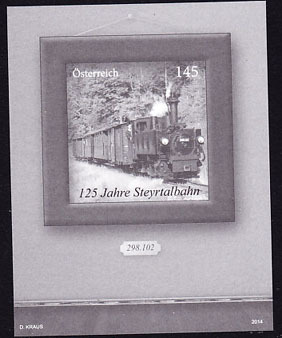 17713 EP AUSTRIA (2014) Mur Valley narrow-gauge railway 120th anniversary. Black print. 319 EP AUSTRIA (2015) Susanna and the Elders by Tintorello*. Black print. 320 EP AUSTRIA (2015) Young art in Austria - Svenja Deininger*. Black print. 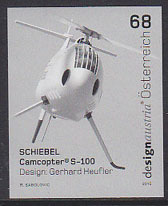 490 EP AUSTRIA (2015) Schiebel camcopter*. Black print. The drones have arrived. 916 EP AUSTRIA (2015) Painting in Liefering church*. Black print. 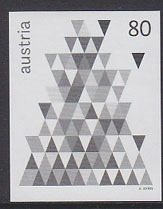 917 EP AUSTRIA (2015) Stylised Christmas tree*. Black print. 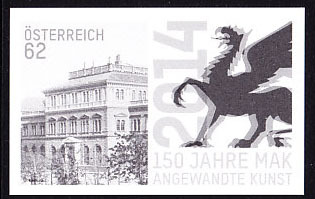 1079 EP AUSTRIA (2015) Leoben University - 175 years*. Black print. Mining & metallurgy. 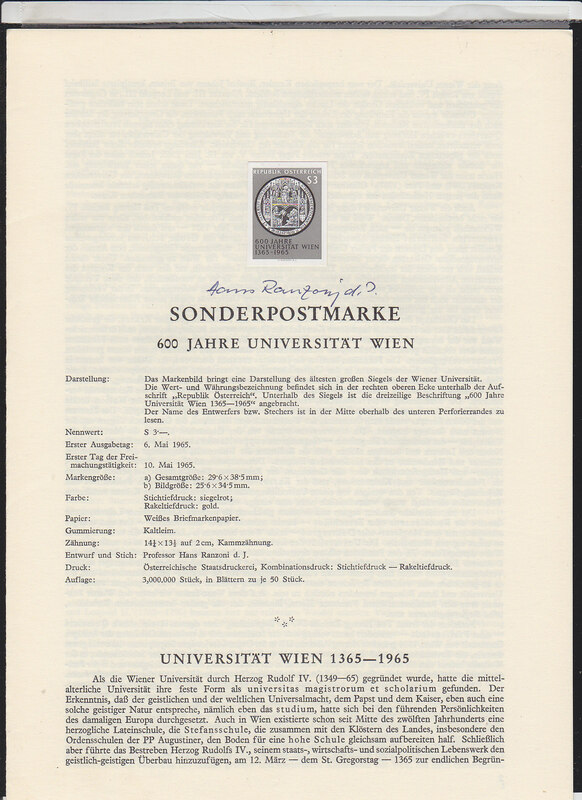 1080 EP AUSTRIA (2015) Vienna University - 200 years*. Black print. 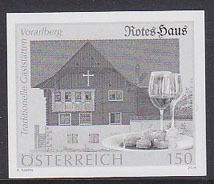 1411 EP AUSTRIA (2015) Dining with tradition - red wine*. Black print. 2770 EP AUSTRIA (2015) Semmering railway steam operation*. Black print. 18018 EP AUSTRIA (2015) Carnentum wine district. Black print. 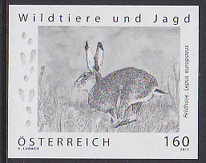 18076 EP AUSTRIA (2015) European hare*. Black print. 18128 EP AUSTRIA (2015) Liaunig Museum*. Black print. 18129 EP AUSTRIA (2015) Haas haus*. Black print. 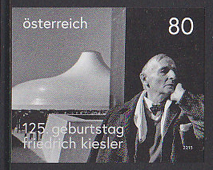 18130 EP AUSTRIA (2015) Friedrich Kiesler 125 anniversary*. Black print. 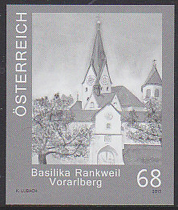 18192 EP AUSTRIA (2015) Rankweil basilica Vorarlberg*. Black print. 18216 EP AUSTRIA (2015) Modern art by Hunert Schmalix*. Black print of S/S. 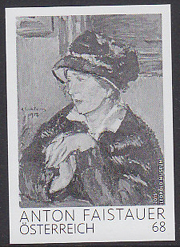 18217 EP AUSTRIA (2015) "Lady with a dark hat" by Faistauer. Black print. 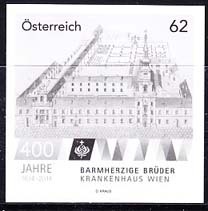 18247 EP AUSTRIA (2015) Austria Literature Museums*. Black print. 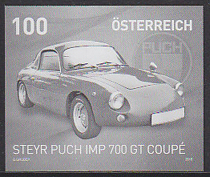 18257 EP AUSTRIA (2015) Puch Imp 700 Gt Coupe*. Black print. 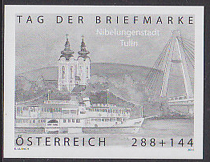 18354 EP AUSTRIA (2015) Rose bridge of Tulin*. Black print. 18382 EP AUSTRIA (2015) Austrians in Hollywood - Maria Schell*. Black print. 18411 EP AUSTRIA (2015) Tuxer dress*. Black print. 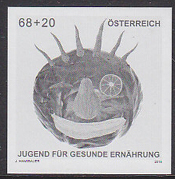 18544 EP AUSTRIA (2015) Youth for a Healthy Diet*. Black print. 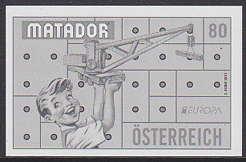 18557 EP AUSTRIA (2015) Matador construction set*. Black print. 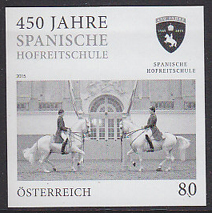 18590 EP AUSTRIA (2015) 450th anniversary of Spanish Riding School*. Black print. 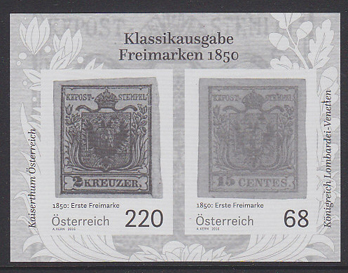 18718 EP AUSTRIA (2015) Alps-Adriatic philately. Black print. 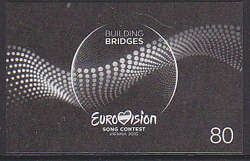 18723 EP AUSTRIA (2015) Eurovision song contest*. Black print. 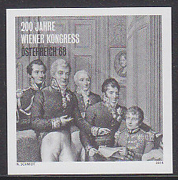 18763 EP AUSTRIA (2015) 200th anniversary of Vienna Congress at end of Napoleonic Wars*. Black print. 18773 EP AUSTRIA (2015) Photographic art - Gregor Schmoll. Black print. 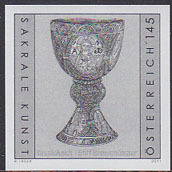 18862 EP AUSTRIA (2015) Chalice cover from Pentecost Ornament collection*. Black print. 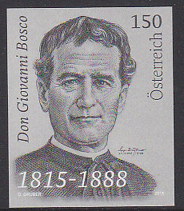 18863 EP AUSTRIA (2015) Don Giovanni Bosco*. Black print. 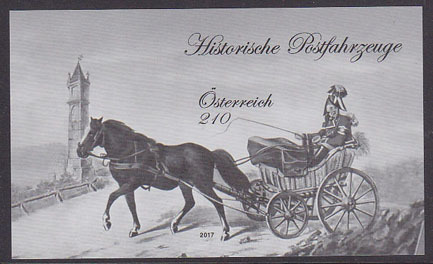 18972 EP AUSTRIA (2015) Cariol carriage*. Black print of S/S. 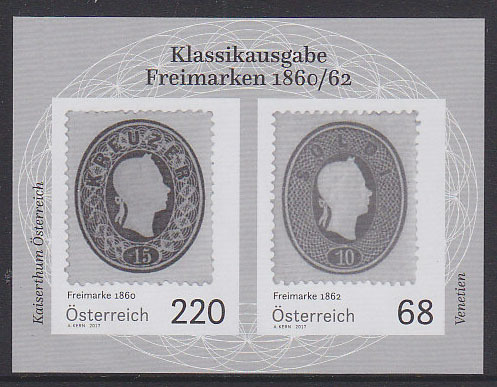 18987 EP AUSTRIA (2015) 175th anniversary of Penny Black stamp*. Black print of S/S. 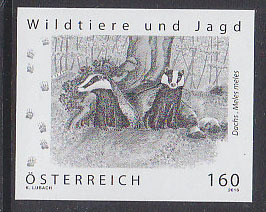 6061 EP AUSTRIA (2016) Badgers. Black print. 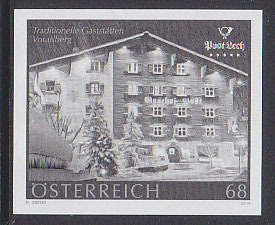 6155 EP AUSTRIA (2016) Gasthof Post - Lech. Black print. Famous ski resort. 6156 EP AUSTRIA (2016) T-Center. Black print. 6345 EP AUSTRIA (2016) Saving art cached in WWII. Black print. 6544 EP AUSTRIA (2016) Austrian Air Police. Black print. 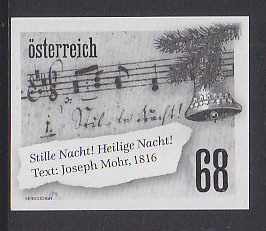 6941 EP AUSTRIA (2016) Music to Silent Night. Black print. 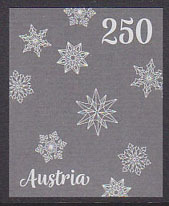 6942 EP AUSTRIA (2016) Christmas tree ornaments. Black print. 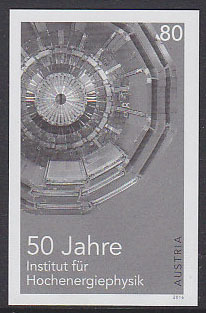 8124 EP AUSTRIA (2016) High Energy Physics Institute 50th anniversary. Black print. 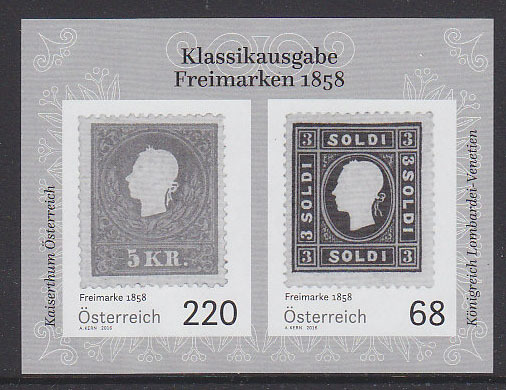 8441 EP AUSTRIA (2016) Stamps of 1858. Black print of S/S. 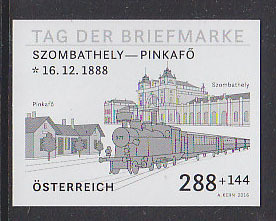 8631 EP AUSTRIA (2016) Szombathely-Pinkafo Railway. Black print. 8632 EP AUSTRIA (2016) Geichenberger railway. Black print. 18019 EP AUSTRIA (2016) Glass of wine - Blaufrankisch. Black print. 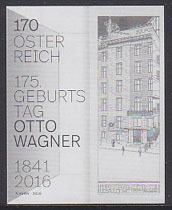 18131 EP AUSTRIA (2016) Otto Wagner designs. Black print. 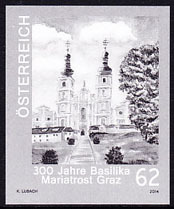 18193 EP AUSTRIA (2016) Mariazell basilica*. Black print. 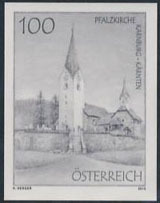 18194 EP AUSTRIA (2016) Wallsfahrtskirche. Black print. 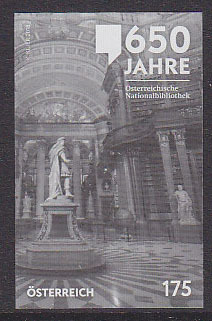 18218 EP AUSTRIA (2016) 125th anniversary of Kunst-Historisches Museum*. Black print. 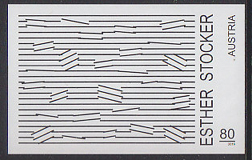 18219 EP AUSTRIA (2016) Abstract art by Esther Stocker*. Black print. 18220 EP AUSTRIA (2016) Contemporary art by Martha Jungwirth*. Black print. 18221 EP AUSTRIA (2016) The Future Factor. Black print. 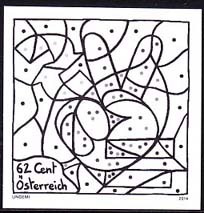 18222 EP AUSTRIA (2016) Contemporary art by Erwin Bohatsch*. Black print. 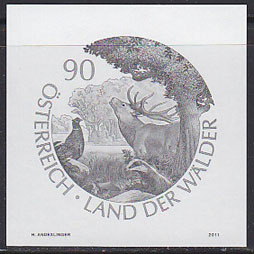 18223 EP AUSTRIA (2016) "Wiedererstehen zu neuem leben" by Waldmuller. Black print. 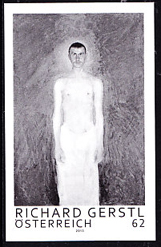 18224 EP AUSTRIA (2016) Nudes by Koloman Moser. Black print. 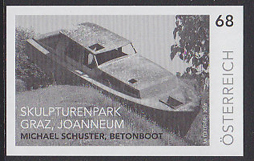 18240 EP AUSTRIA (2016) Concrete boat by Michael Schuster*. Black print. 18241 EP AUSTRIA (2016) Madonna from Steyr church*. Black print. 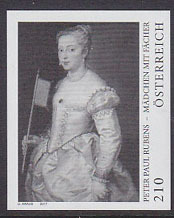 18248 EP AUSTRIA (2016) Marie von Ebner-Eschenbach*. Dog*. Black print. 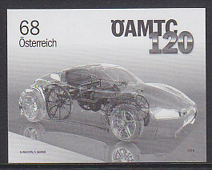 18258 EP AUSTRIA (2016) Modern car superimposed over ancient auto*. Black print. 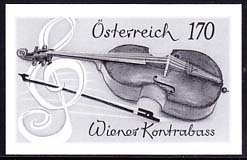 120th anniversary of Austrian Touring Association. 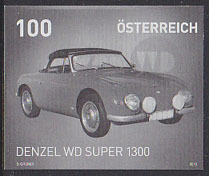 18259 EP AUSTRIA (2016) Denzel WD Super 300. Black print. 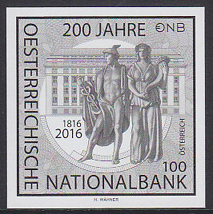 18285 EP AUSTRIA (2016) National bank 200th anniversary*. Black print. 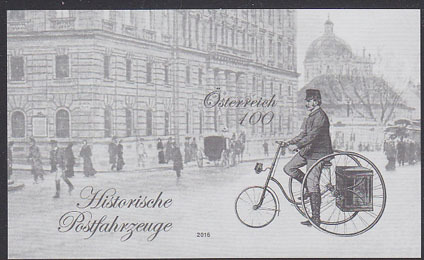 18294 EP AUSTRIA (2016) Mail carriers tricycle. Black print of S/S. 18373 EP AUSTRIA (2016) UNICEF*. Black print. 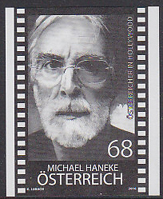 18383 EP AUSTRIA (2016) Michael Haneme - Austrians in Hollywood*. Black print. 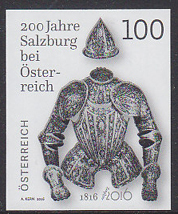 18388 EP AUSTRIA (2016) Suit of armor*. Black print. 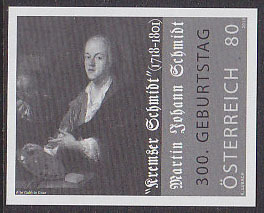 200th anniversary of Salzburg becoming part of Austria. 18389 EP AUSTRIA (2016) Archducal hat (400th anniversary)*. Black print. 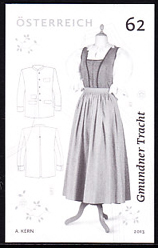 18412 EP AUSTRIA (2016) Montafon valley dress*. Black print. 18413 EP AUSTRIA (2016) Schardinger dress*. Black print. 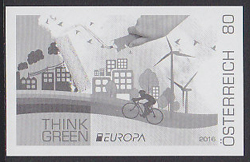 18461 EP AUSTRIA (2016) Think Green. Black print. 18522 EP AUSTRIA (2016) Flower. 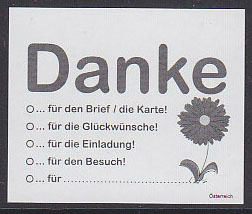 Black print of stamp with checklist of things to give thanks for. 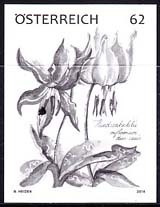 18523 EP AUSTRIA (2016) Tiger lily*. Black print. 18548 EP AUSTRIA (2016) Wooden chairs. Black print. 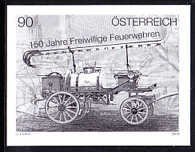 18599 EP AUSTRIA (2016) Traditional trademarks - Fritzelack*. Black print. 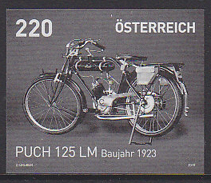 18708 EP AUSTRIA (2016) Puch 125 LM Baujahr 1923*. Black print. 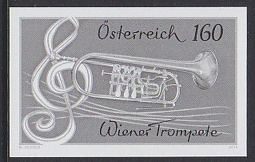 18759 EP AUSTRIA (2016) Viennese trumpet*. Black print. 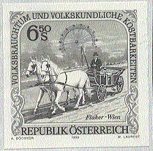 18769 EP AUSTRIA (2016) Ferris wheel*. Black print. 250th anniversary of Vienna Park. 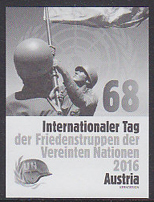 18770 EP AUSTRIA (2016) International Day of UN Peacekeepers*. Black print. 18774 EP AUSTRIA (2016) Steeple-hat woman - photographic art by Dorothee Golz*. Black print. 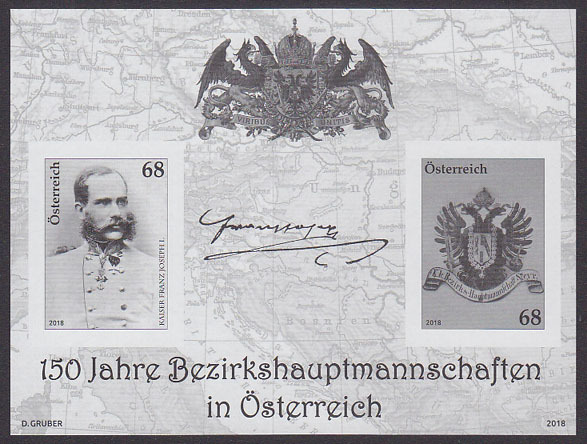 18788 EP AUSTRIA (2016) 700th anniversary of Scharding*. Black print. 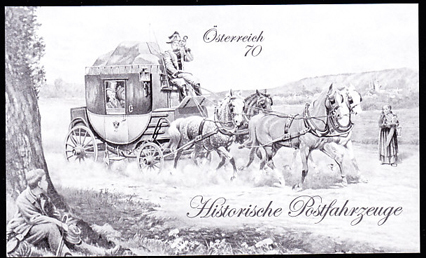 18826 EP AUSTRIA (2016) Postcrossing*. Black print. 18827 EP AUSTRIA (2016) 16th century mail carrier*. Black print. 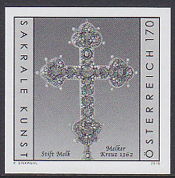 18864 EP AUSTRIA (2016) Melk cross*. Black print. 18920 EP AUSTRIA (2016) Josef Ressel*. Ship propelling screw*. Black print. 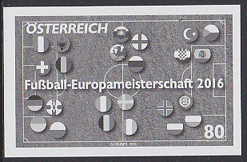 18966 EP AUSTRIA (2016) European soccer championship. Black print. 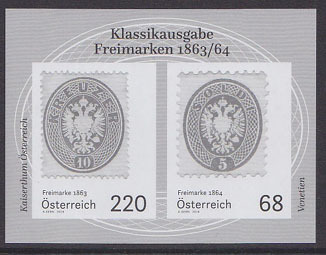 18988 EP AUSTRIA (2016) Classic stamps*. Black print of S/S. 19163 EP AUSTRIA (2016) Kaiser Franz Joseph I. Black print. 6037 EP AUSTRIA (2017) Vienna wine region. Black print. 6157 EP AUSTRIA (2017) Post am Rochus. Black print. Shopping mall. 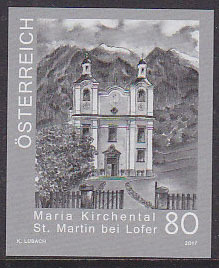 6209 EP AUSTRIA (2017) Maria Kirchental sanctuary. Black print. 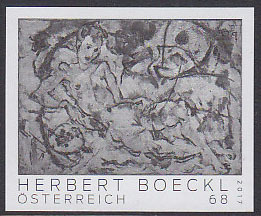 6346 EP AUSTRIA (2017) Abstract by Herbert Boeckle. Black print. 6347 EP AUSTRIA (2017) Abstract by Tobias Pils. Black print. 6348 EP AUSTRIA (2017) Abstract by Walter Vapova. Black print. 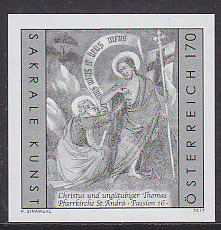 6349 EP AUSTRIA (2017) Christ and doubting Thomas. Black print. Fresco at Carinthian church. 6419 EP AUSTRIA (2017) Peter Mitterhofer. Typewriter. Black print. 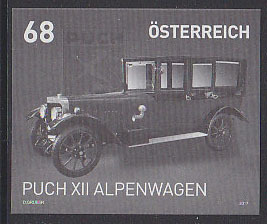 6476 EP AUSTRIA (2017) Puch XII Alpenwagen. Black print. 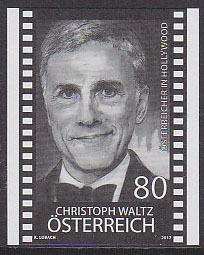 6962 EP AUSTRIA (2017) Christoph Waltz. Black print. Actor who worked withh Quentin Tarantino (Django Unchained). 6965 EP AUSTRIA (2017) Clown. Black print. 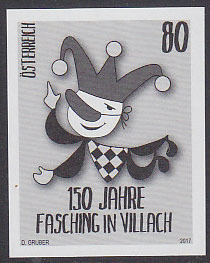 150 years of carnival in Villach. 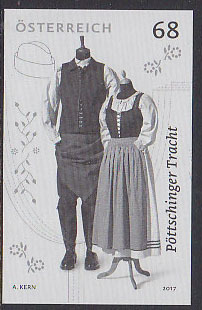 7038 EP AUSTRIA (2017) Classic costumes of Pottsching. Black print. 7177 EP AUSTRIA (2017) Schloss Schonbrunn. Black print. 7376 EP AUSTRIA (2017) Schlierbacher cheese factory. Black print. 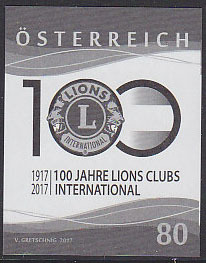 7551 EP AUSTRIA (2017) 100 years of Lions Clubs. Black print. 7715 EP AUSTRIA (2017) 650 years of silver and goldsmiths. Black print. 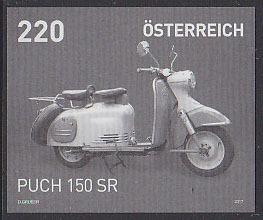 7716 EP AUSTRIA (2017) Puch 150 SR. Black print. 7784 EP AUSTRIA (2017) Vienna Philharmonic 175th anniversary. Black print. 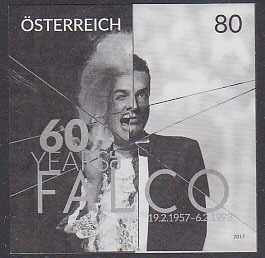 7785 EP AUSTRIA (2017) Falco's 60th birthday. Black print. 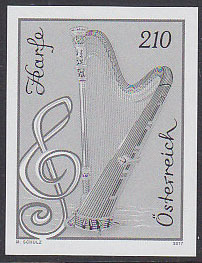 7810 EP AUSTRIA (2017) Concert harp. Black print. 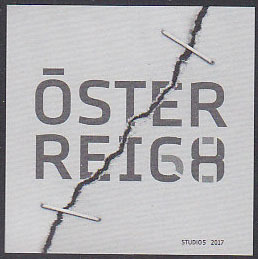 7831 EP AUSTRIA (2017) Stamp held together with staples. Black print. Visions of Austria's future in 2050. 7882 EP AUSTRIA (2017) Photo by Margherita Spiluttini. Black print. 8108 EP AUSTRIA (2017) Bible. Black print. 500th annversary of Reformation. 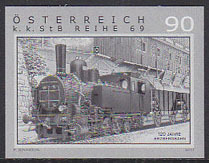 8393 EP AUSTRIA (2017) Postal coach. Black print of S/S. 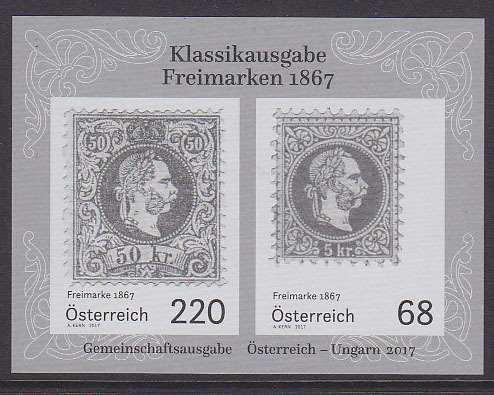 8442 EP AUSTRIA (2017) Early Austrian stamps. Black print of M/S. 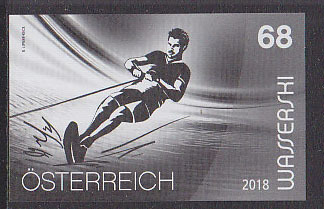 8443 EP AUSTRIA (2017) Early Austrian stamps. Black print of M/S. 8633 EP AUSTRIA (2017) Stainz railway. Black print. 8634 EP AUSTRIA (2017) Brenner electric railway. Black print. 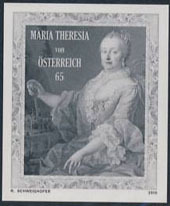 8760 EP AUSTRIA (2017) Maria Theresa. Black print of S/S. 9135 EP AUSTRIA (2017) Red deer. Black print. 9343 EP AUSTRIA (2017) "Girl With Fan" by Rubens. Black print. 9373 EP AUSTRIA (2017) Vienna Weltmuseum. Black print. 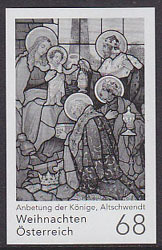 9930 EP AUSTRIA (2017) Adoration of the Magi. Black print. 9931 EP AUSTRIA (2017) Christmas Advent calendar. Black print. 9932 EP AUSTRIA (2017) Christmas ornaments. Black print. 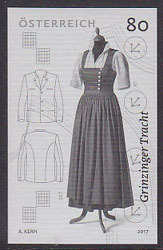 10008 EP AUSTRIA (2017) Traditional costume of Grinzing. Black print. 10071 EP AUSTRIA (2017) University of Applied Art 150th year. Black print. 10413 EP AUSTRIA (2017) Adi Ubleis. Trotter race. Black print. 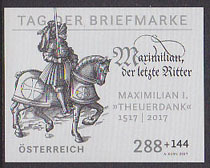 11948 EP AUSTRIA (2017) Emperor Maximilian I (The Last Knight). Heroic poem Theuerdank. Black print. 9344 EP AUSTRIA (2018) Breakfast with champagne glass and pipe by Jan Davisz. de Heem. Black print. 9374 EP AUSTRIA (2018) Large head by Avramidis. Black print. 9506 EP AUSTRIA (2018) Steyr 50 "Baby". Black print. 10243 EP AUSTRIA (2018) Rhododendron. Black print. 10329 EP AUSTRIA (2018) Brentwood chair by Michael Thonet. Black print. 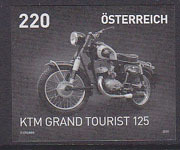 10746 EP AUSTRIA (2018) KTM Grand Tourist 125. Black print. 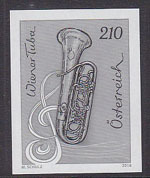 10841 EP AUSTRIA (2018) Viennese tuba. Black print. 10895 EP AUSTRIA (2018) The Generation Question � Cohabitation of Future Generations � "Two Facesô. Black print. 11553 EP AUSTRIA (2018) 1863-4 postage stamps Black print of S/S. 15338 EP AUSTRIA (2018) Kremser Schmidt self portrait. Black print. 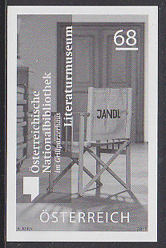 15426 EP AUSTRIA (2018) National library 650th anniversary. Black print. 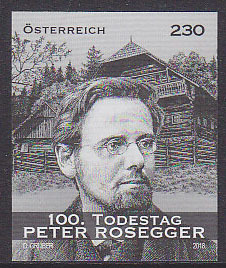 15432 EP AUSTRIA (2018) Peter Rosegger. Black print. 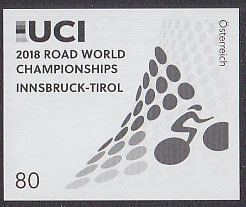 15584 EP AUSTRIA (2018) UCI World Road Cycling Championship. Black print. 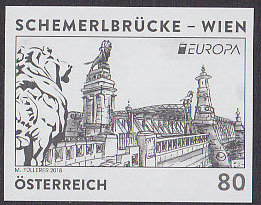 15790 EP AUSTRIA (2018) Schemerl (Lion) bridge - Vienna. Black print. 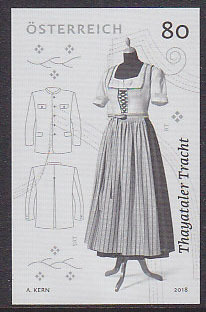 15967 EP AUSTRIA (2018) Traditional costume - Thayatal. Black print. 16066 EP AUSTRIA (2018) Presidency of EU. Black print. 16400 EP AUSTRIA (2018) Hotel Sacher. Sachertort. Black print. 16993 EP AUSTRIA (2018) High altar at Heilig-Geist-Kirche in Vienna. Black print. 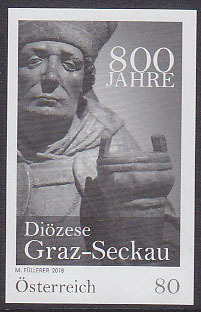 16994 EP AUSTRIA (2018) 800th anniversary of diocese of Graz-Sekau. Black print. 17240 EP AUSTRIA (2018) Catamaran. Black print. 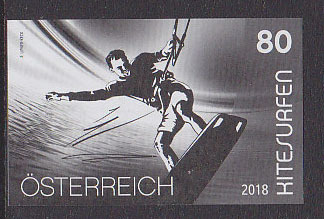 17406 EP AUSTRIA (2018) Waterskiing. Black print. 17407 EP AUSTRIA (2018) Kitesurfing. Black print. 17530 EP AUSTRIA (2018) Gothic church. Transmission tower. Screw steamship. Carinthia highlights. Black print. 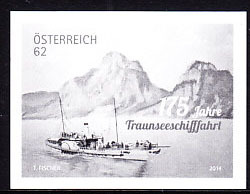 17907 EP AUSTRIA (2018) Franz Josef I. Arms of Bezirkshauptmannschaften. Black print.